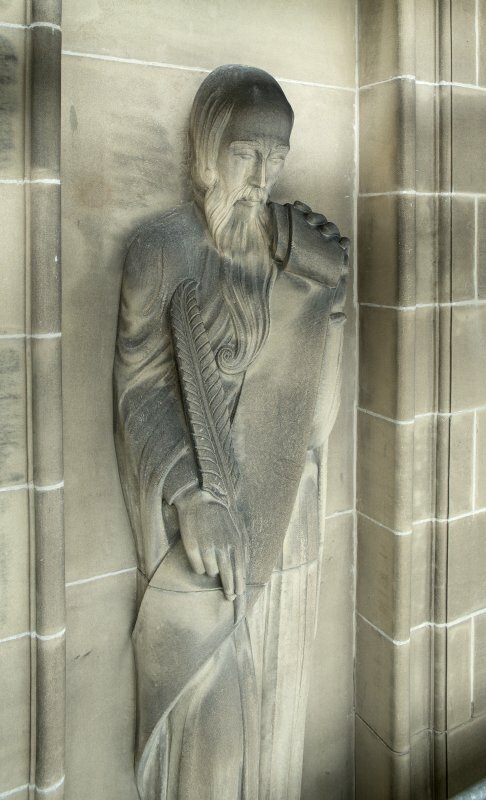 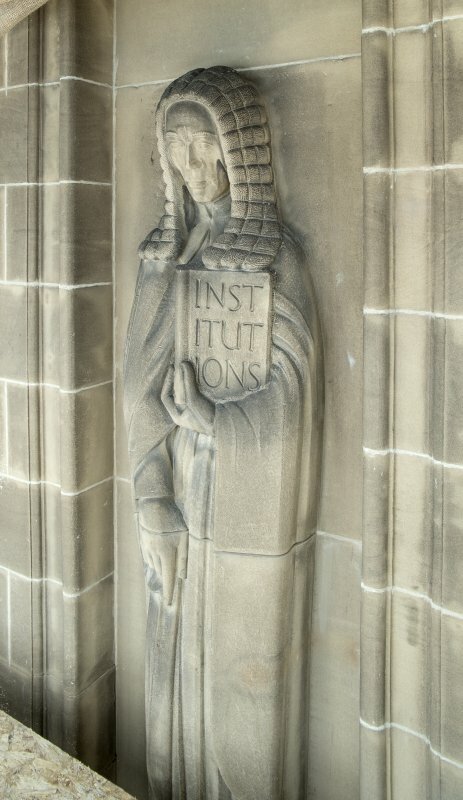 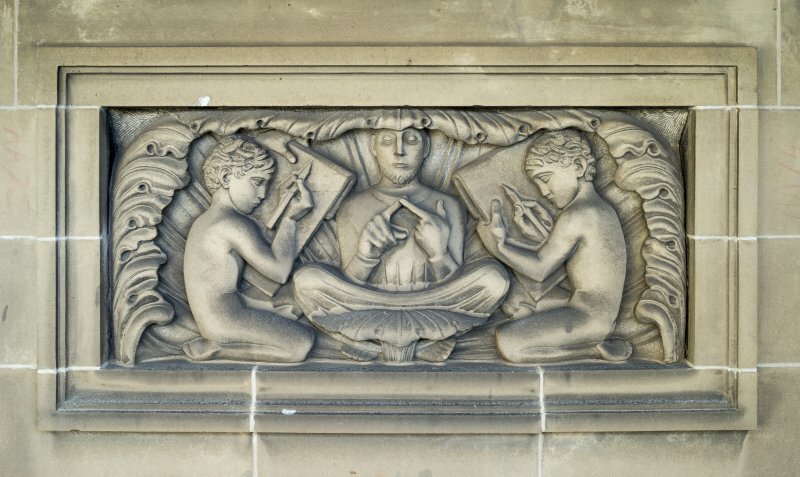 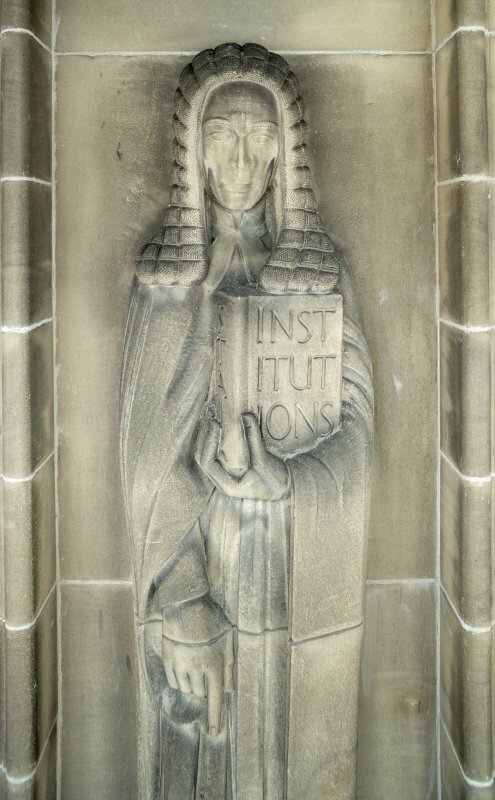 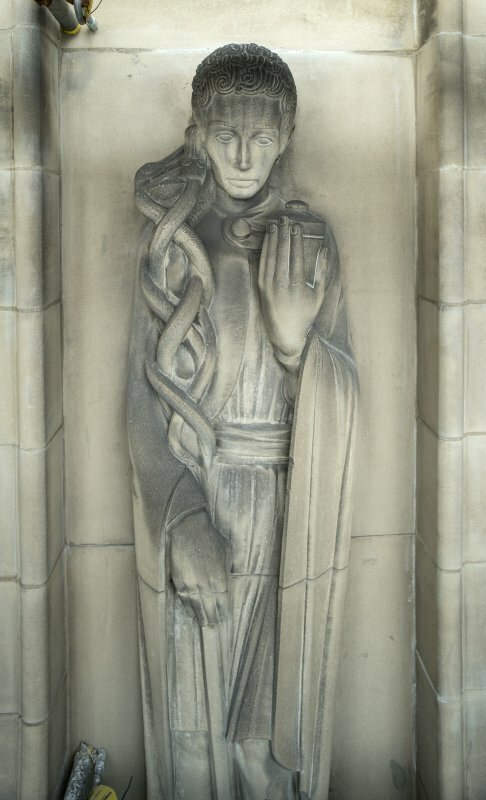 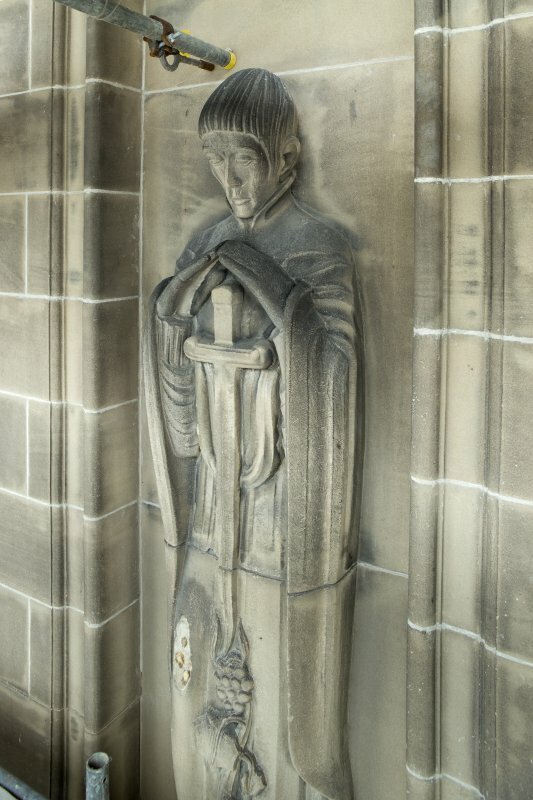 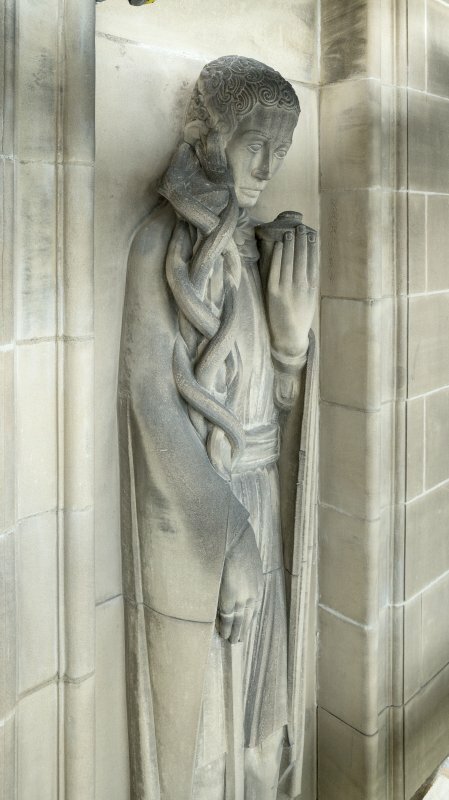 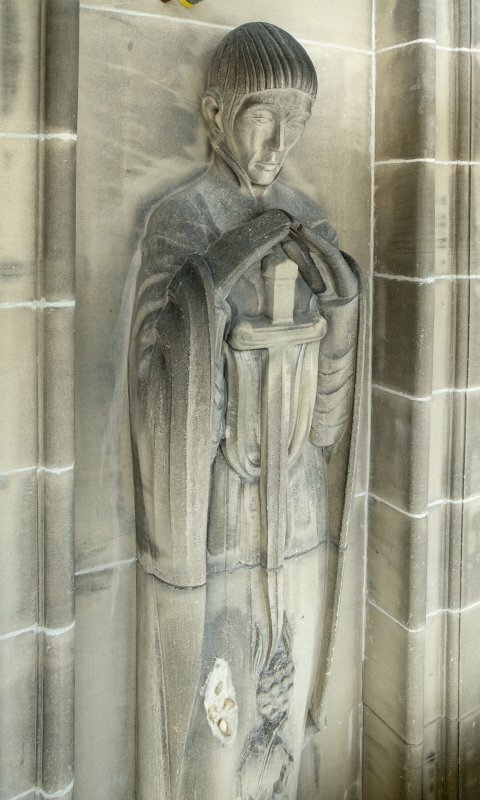 Left hand sculptured panel on North wing. 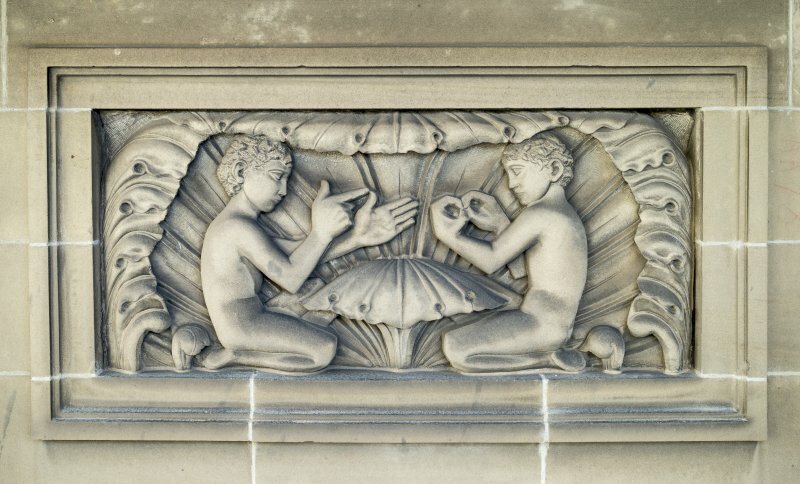 Right hand sculptured panel on South wing. 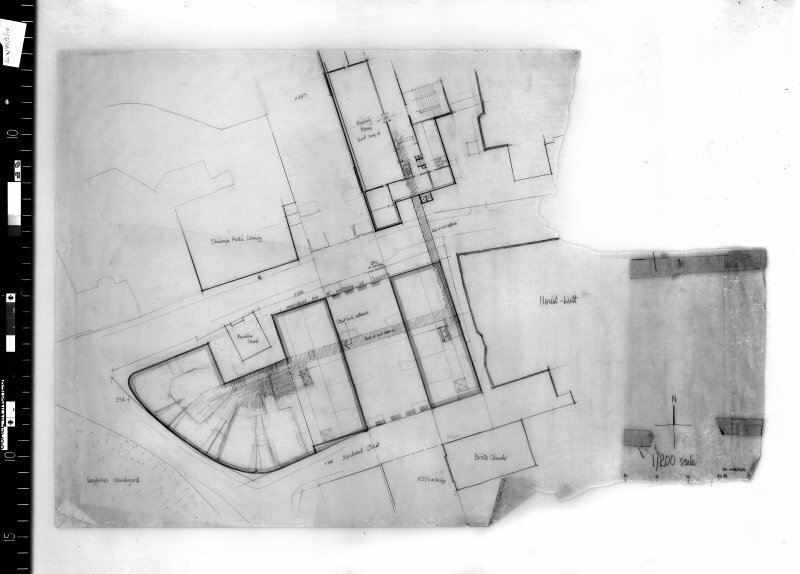 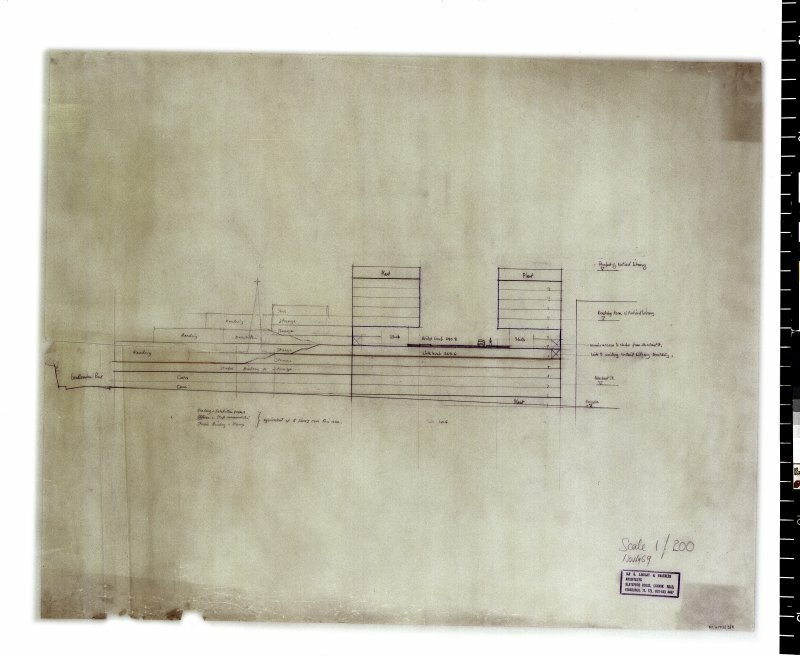 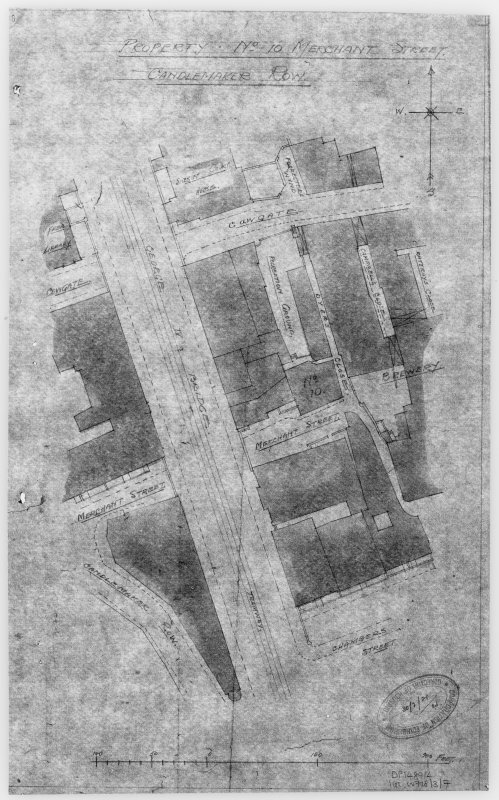 Site plan of number 10 Merchant Street. 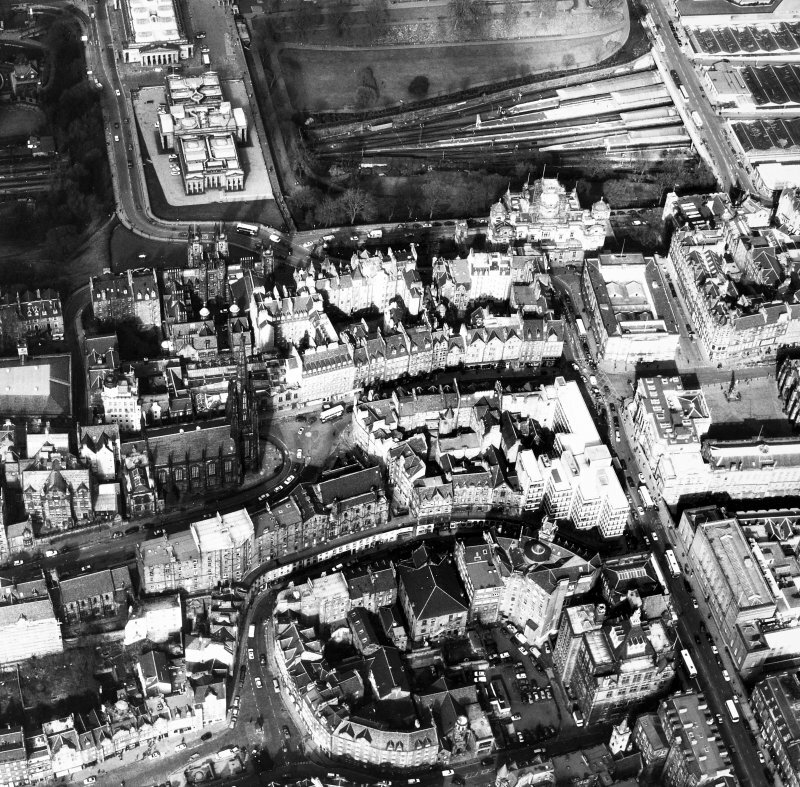 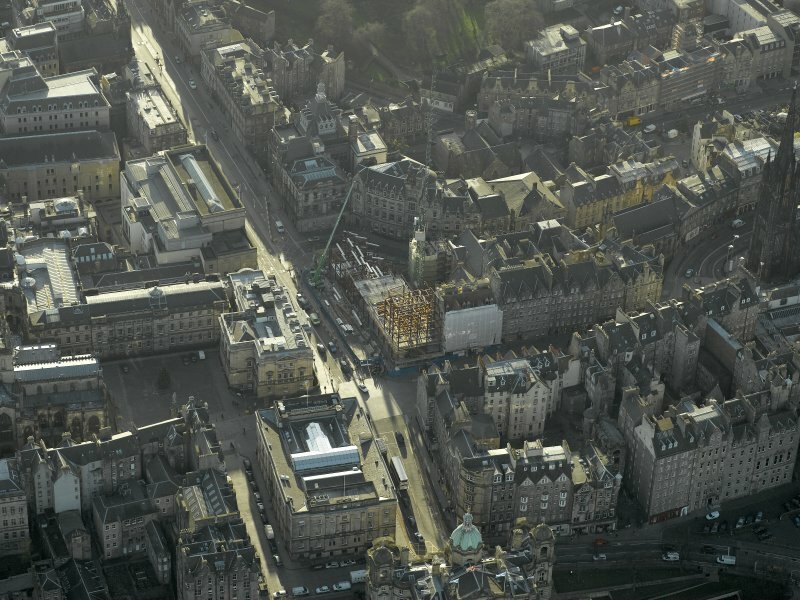 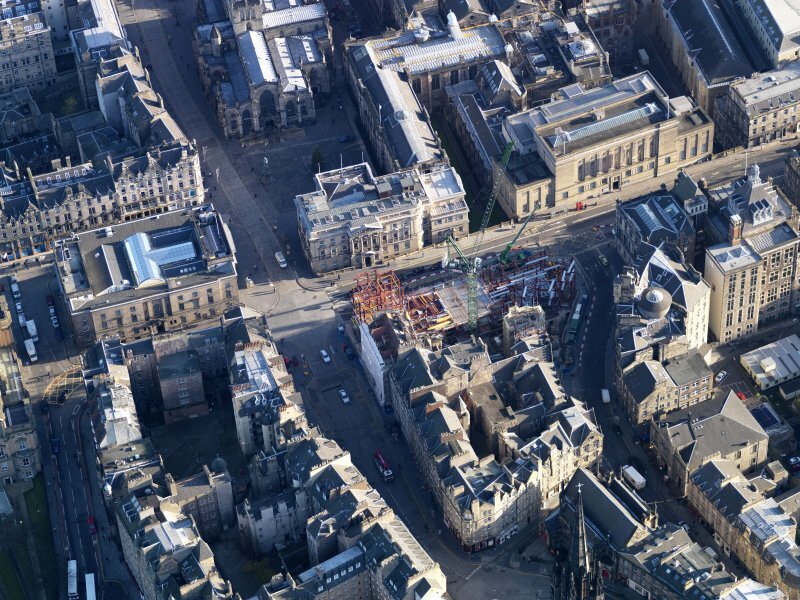 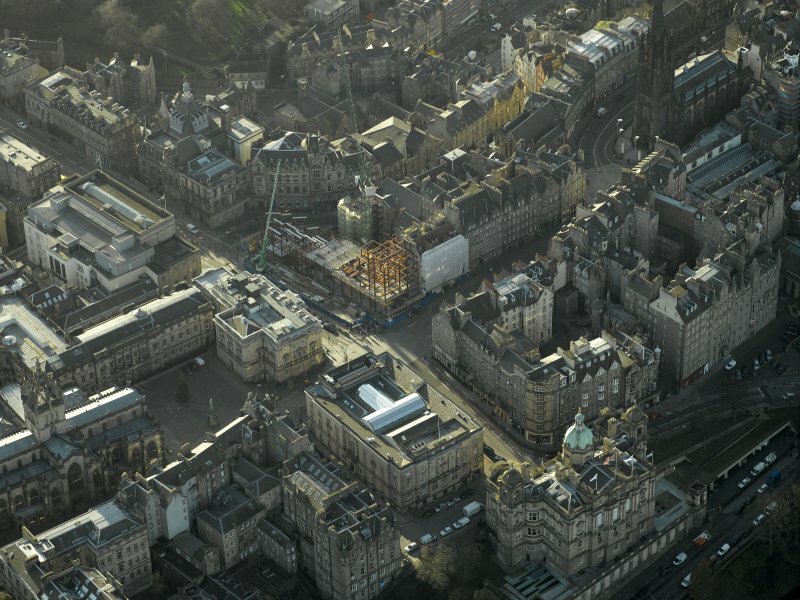 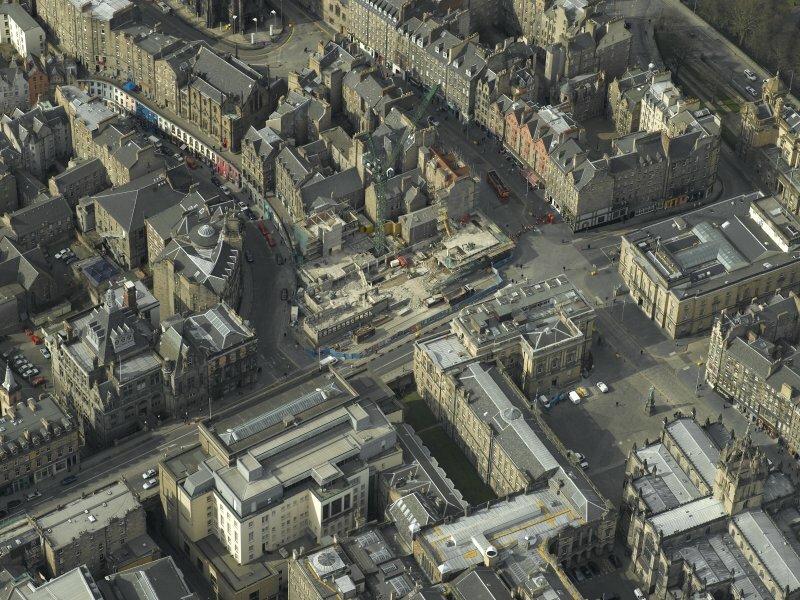 Oblique aerial view centred on new construction work at the junction of High Street and George IV Bridge, taken from the NW. 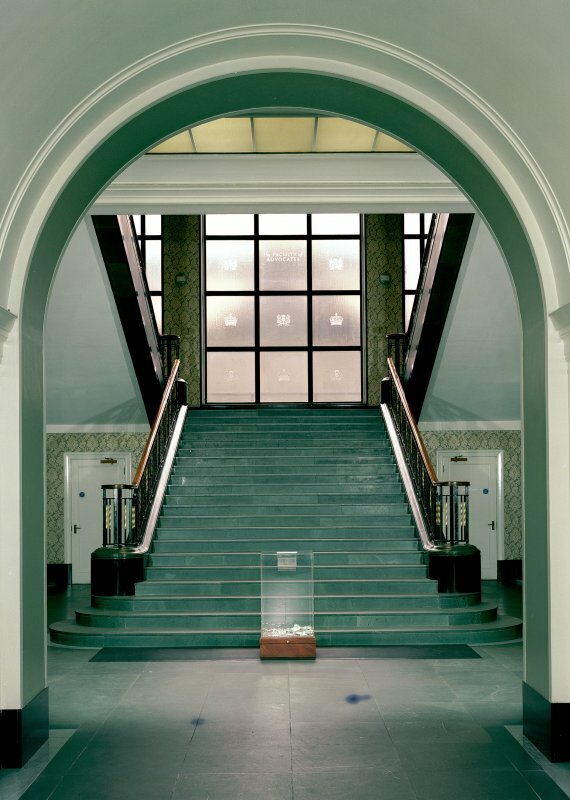 View of display case near entrance. 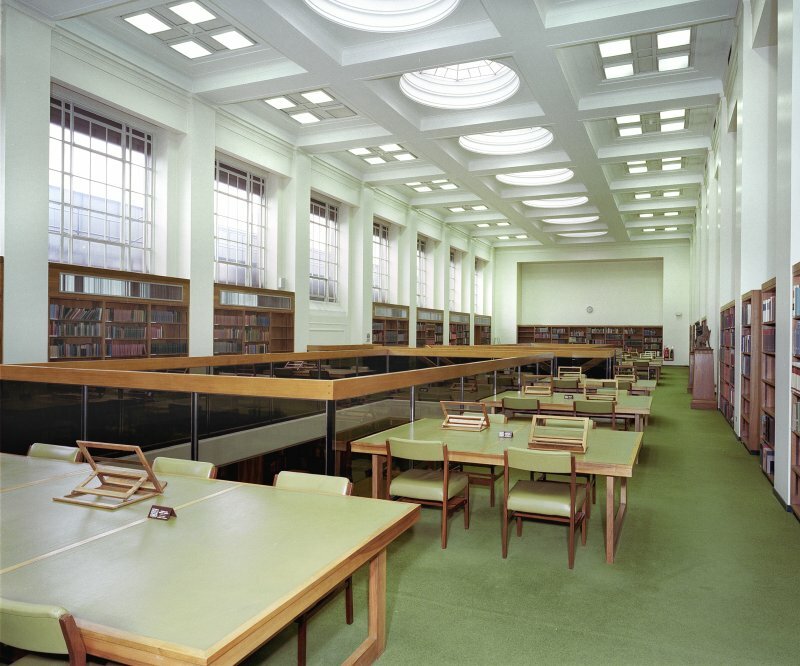 View of Advocates Reading Room. 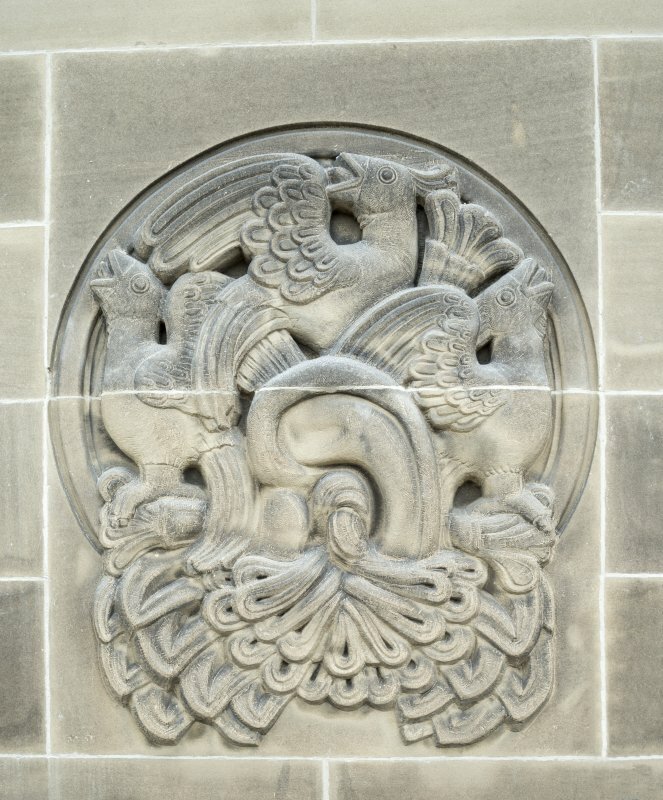 Digital image of E 21140. 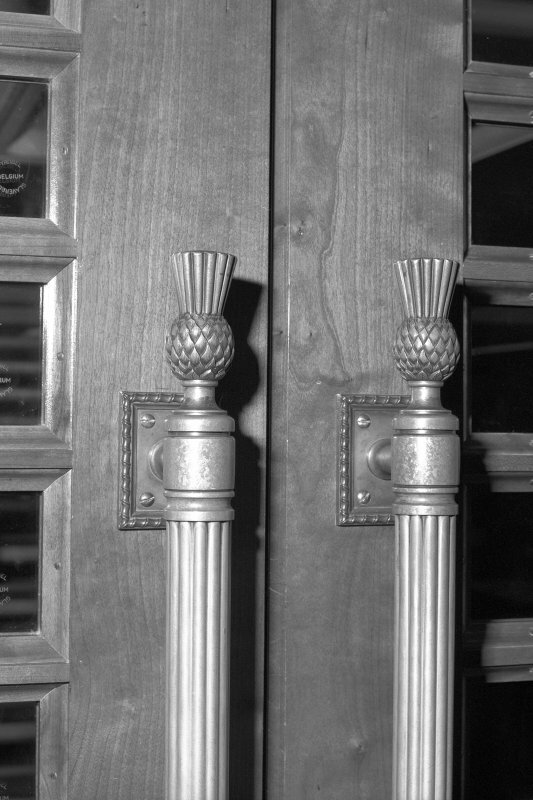 First floor, Catalogue hall, detail of thistle decoration on door handles. 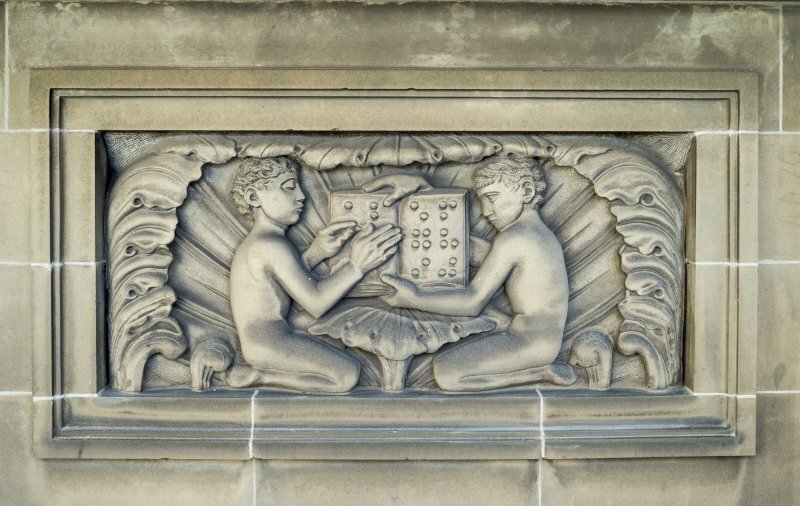 Digtial image of C 44286. 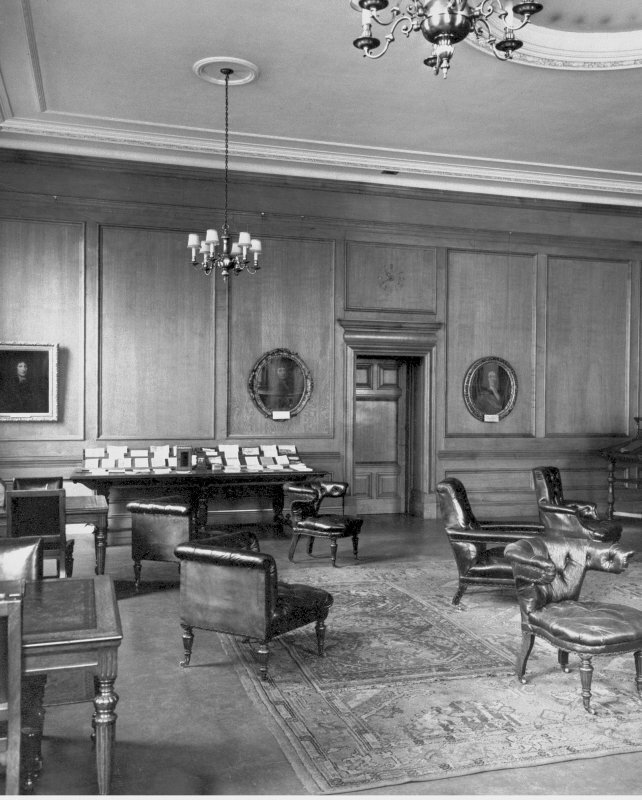 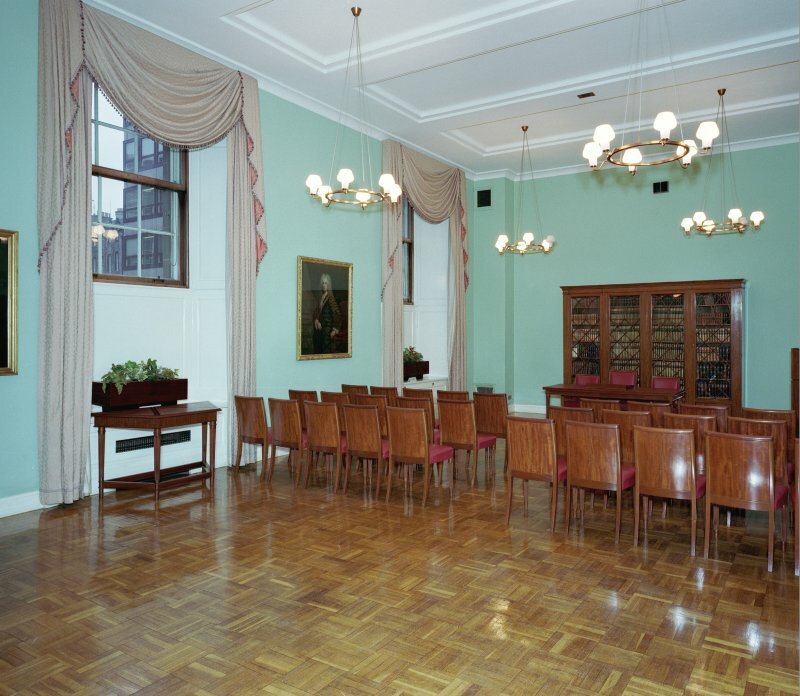 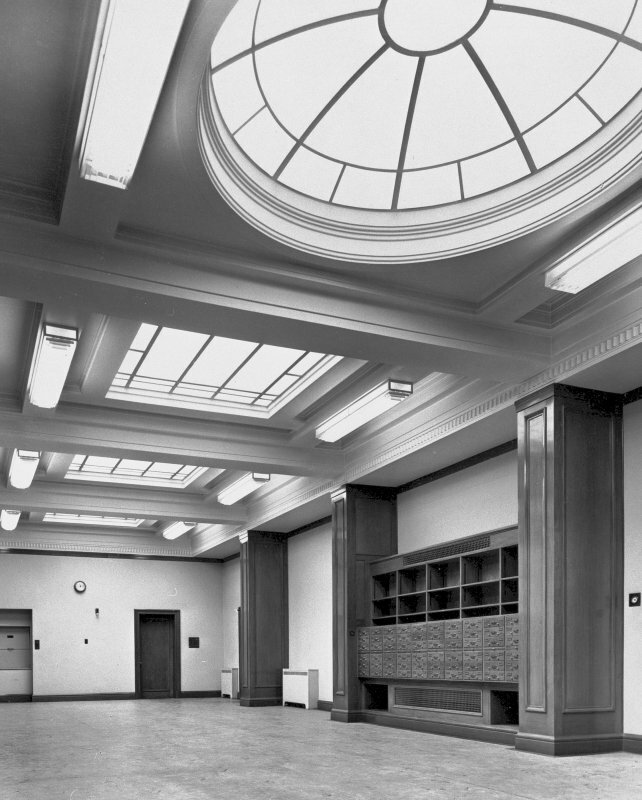 Ground floor, Board room, general view from South East. 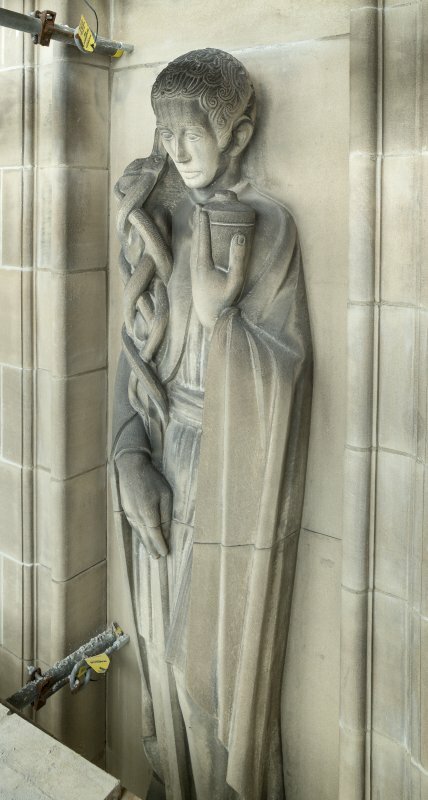 Digital image of C 44297 CN. 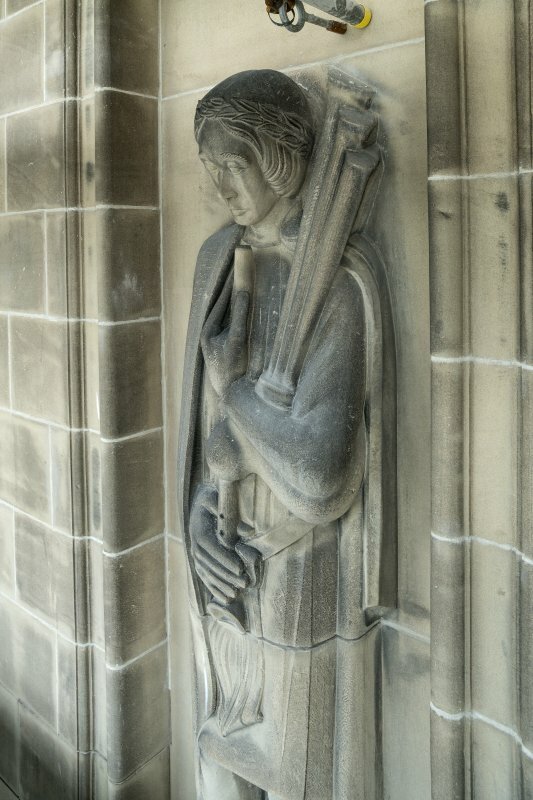 General view of roundel above Medicine figure. 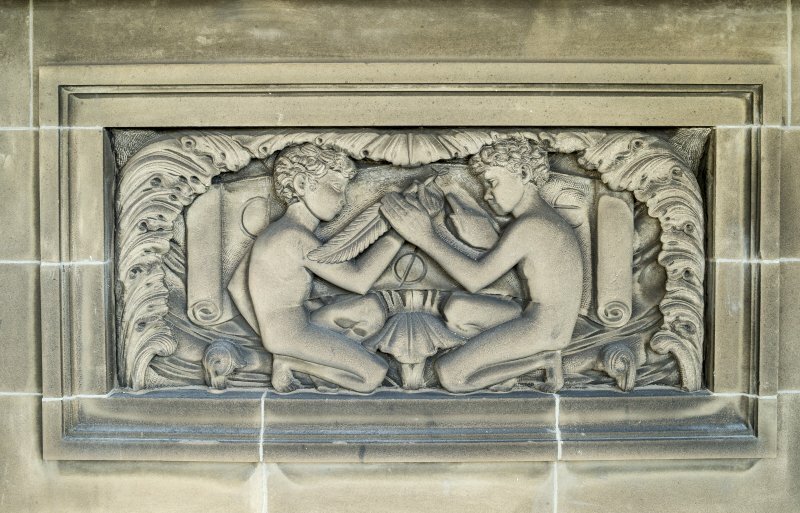 Right hand sculptured panel on North wing. 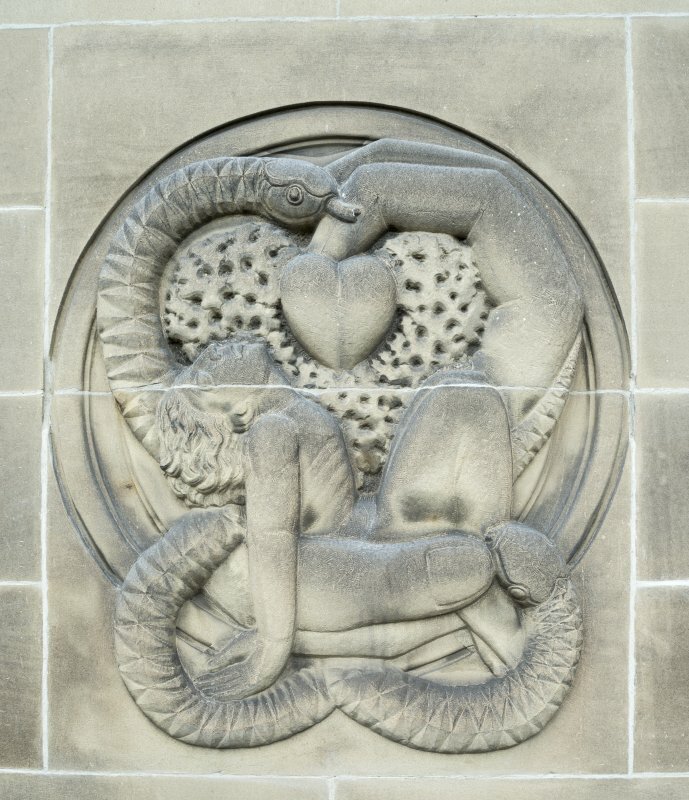 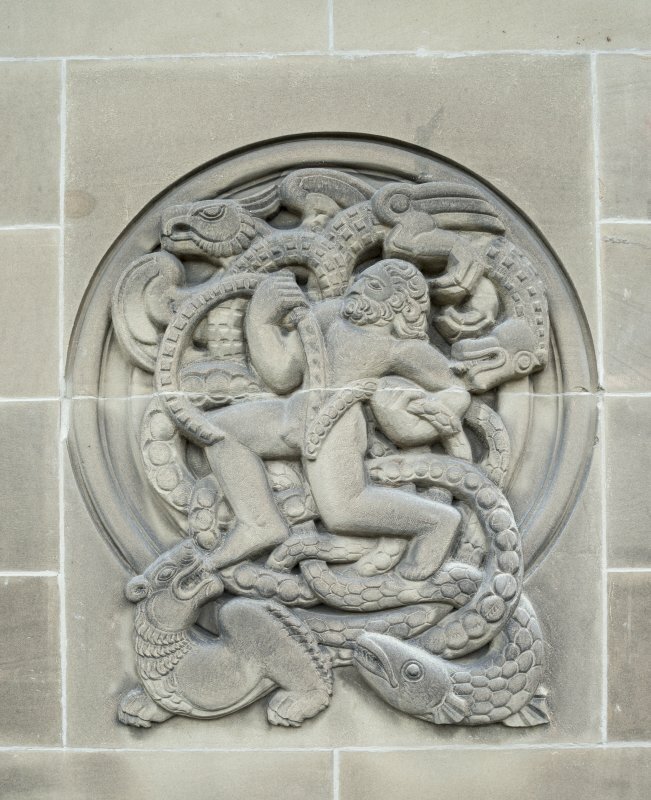 Sculptured panel on South face of South wing. 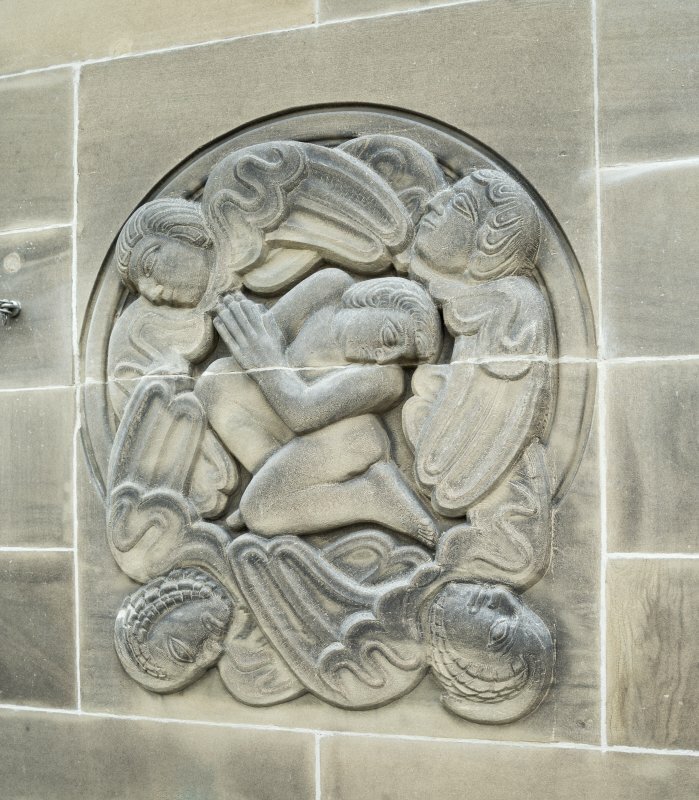 View of N wing of W facade of National Library of Scotland, showing panels carved with the 'Arts of Communication'. 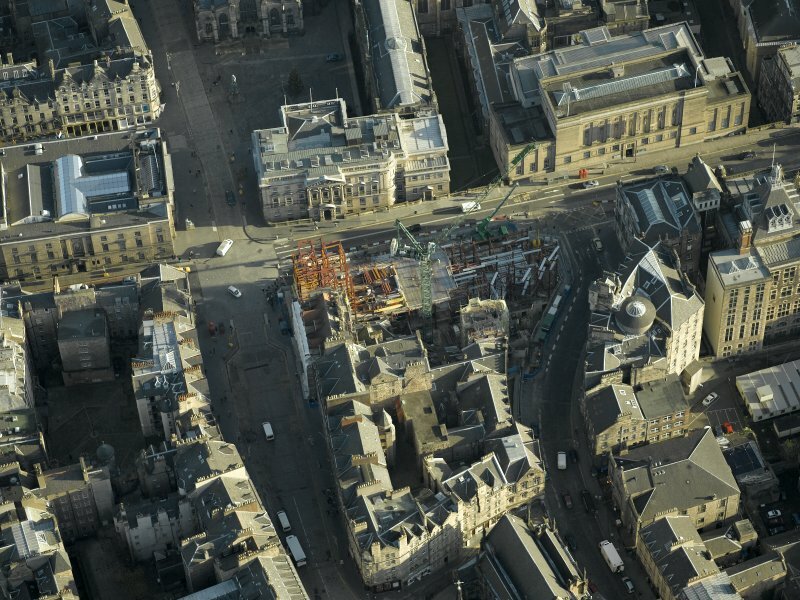 Oblique aerial view centred on new construction work at the junction of High Street and George IV Bridge, taken from the SW.
Oblique aerial view centred on new construction work at the junction of High Street and George IV Bridge, taken from the W.
View of main staircase. 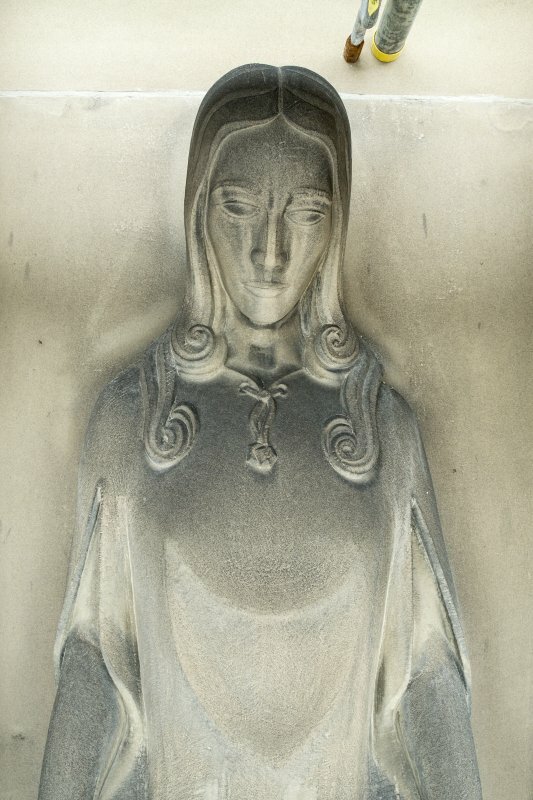 Digital image of E 21144. 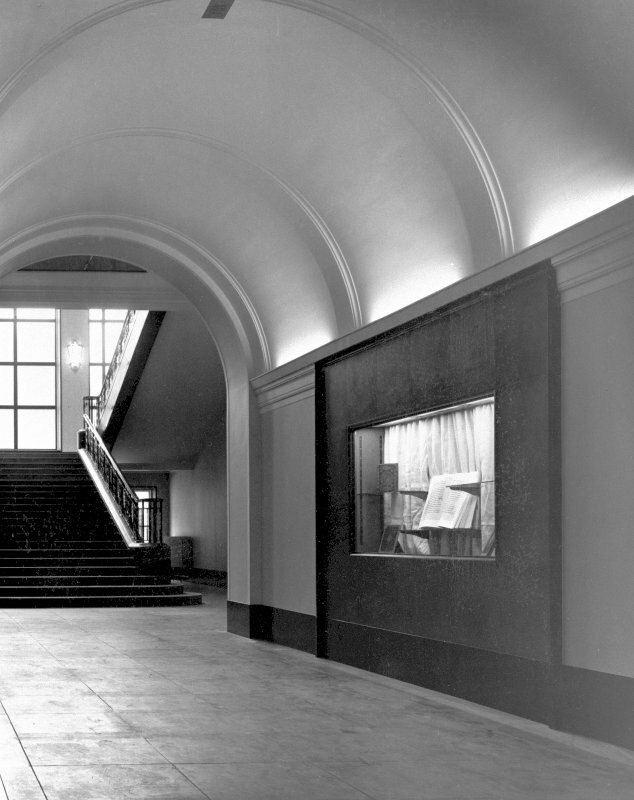 Ground floor, Entrance vestibule, general view from North East. 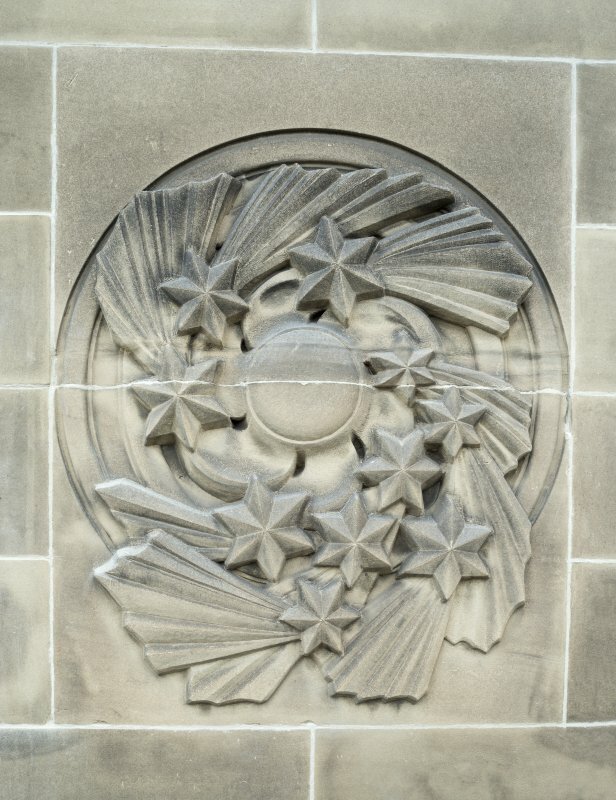 Digital image of C 44295. 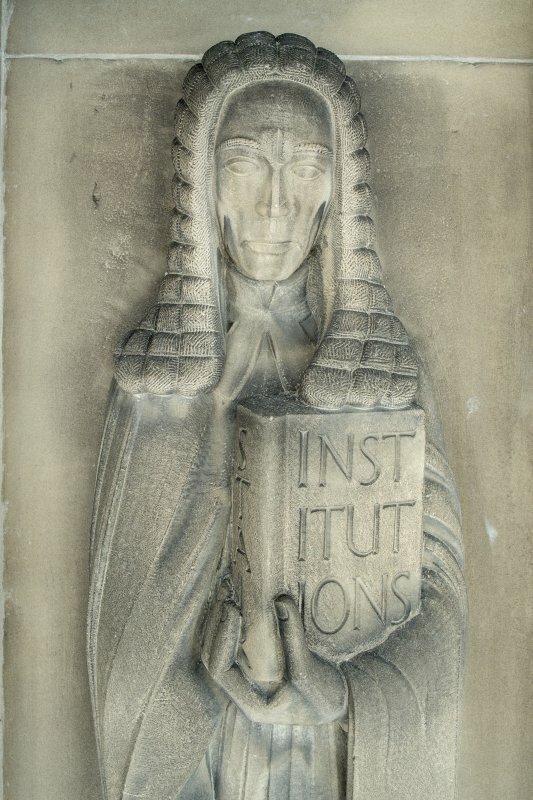 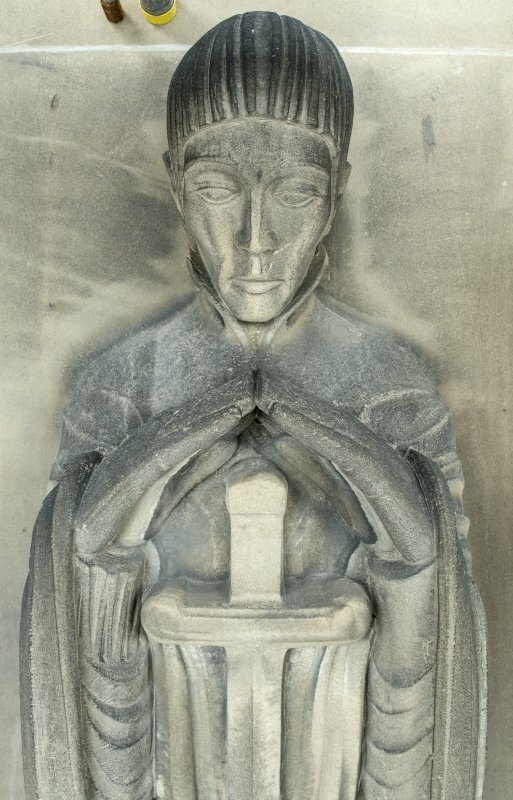 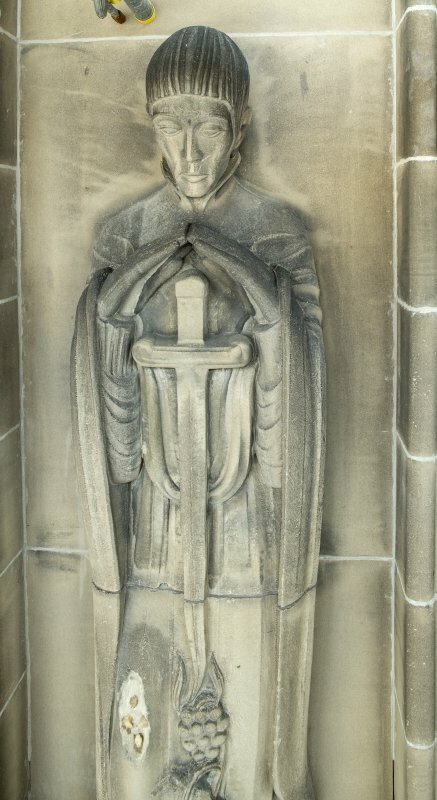 General view of roundel above Justice figure. 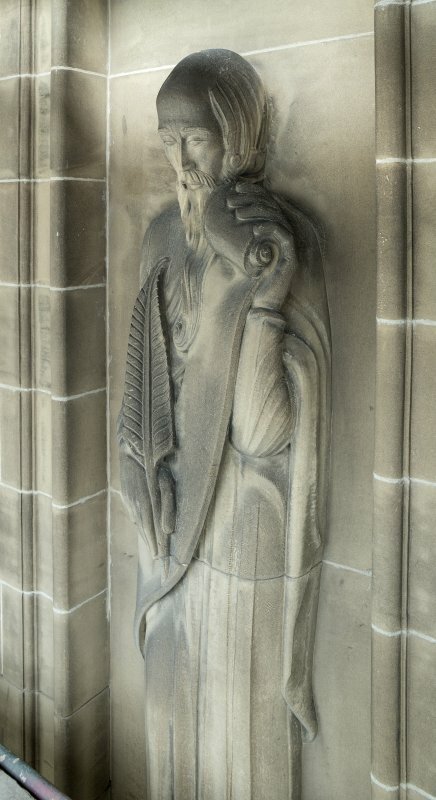 Figure sculpture representing The Poetic Muse. 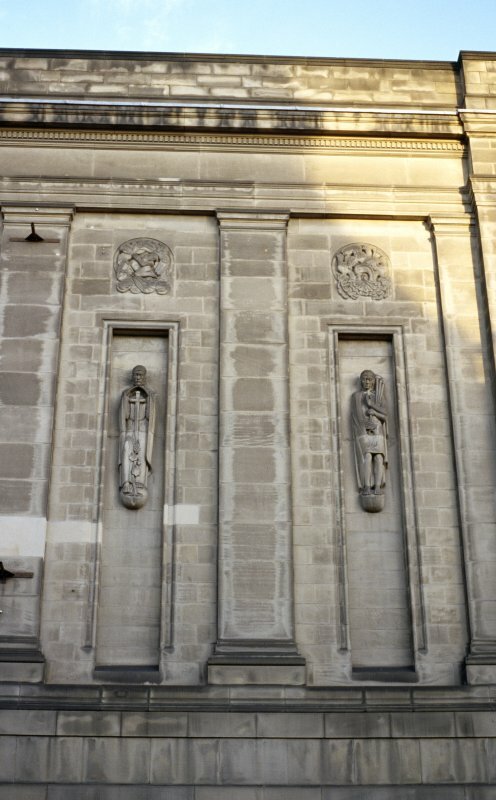 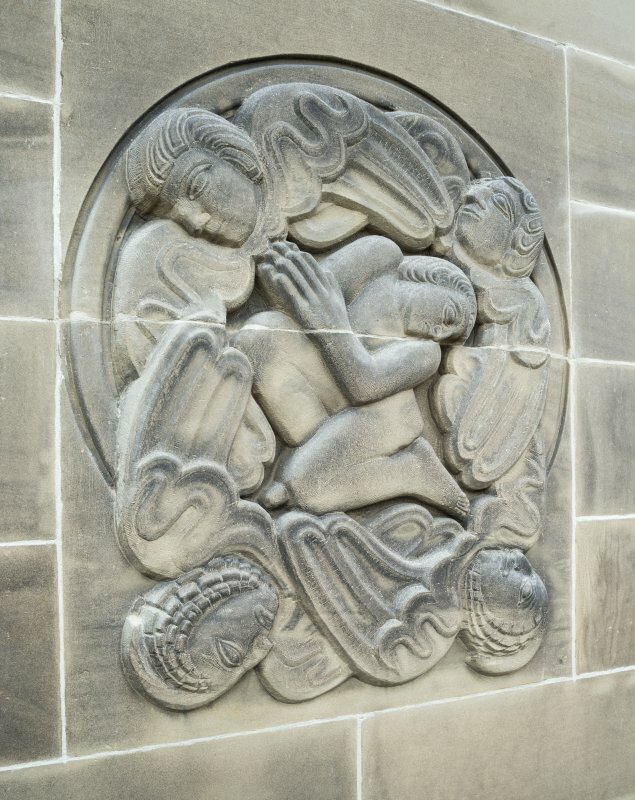 View of part of W facade of National Library of Scotland, showing carved personifications of Theology (left) and Music (right), with Celtic motif roundels above. 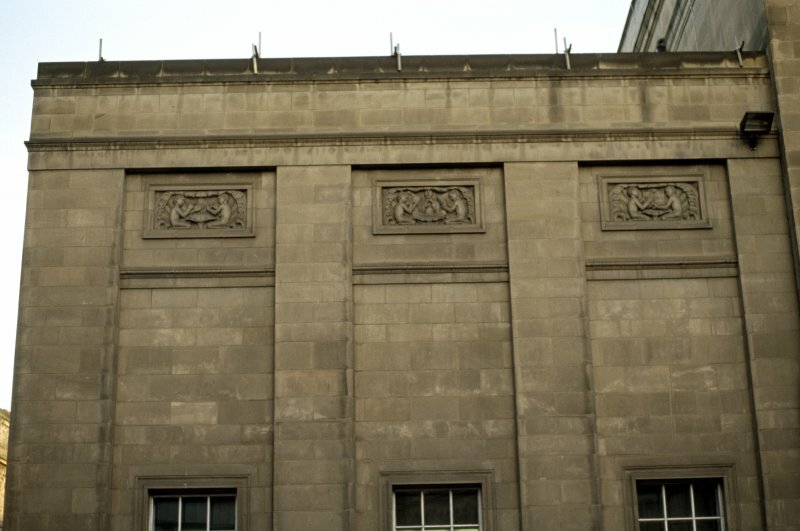 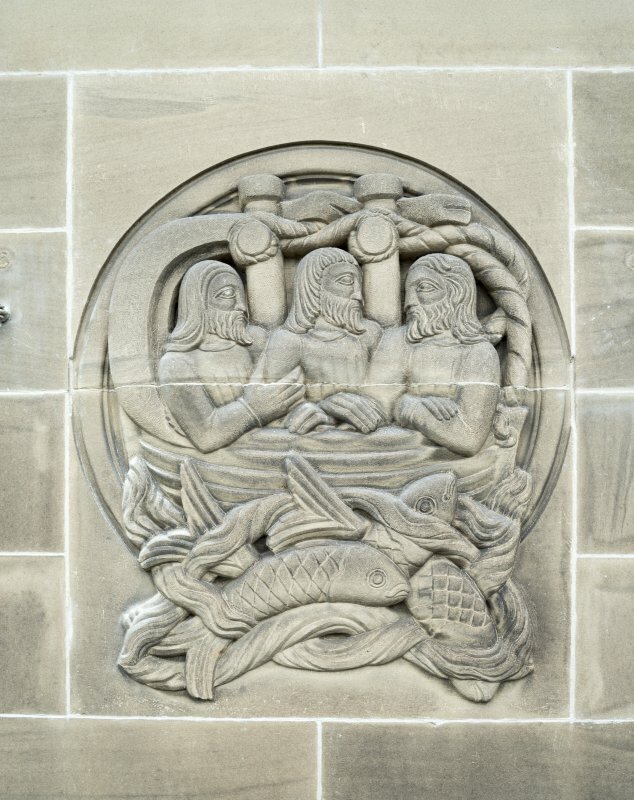 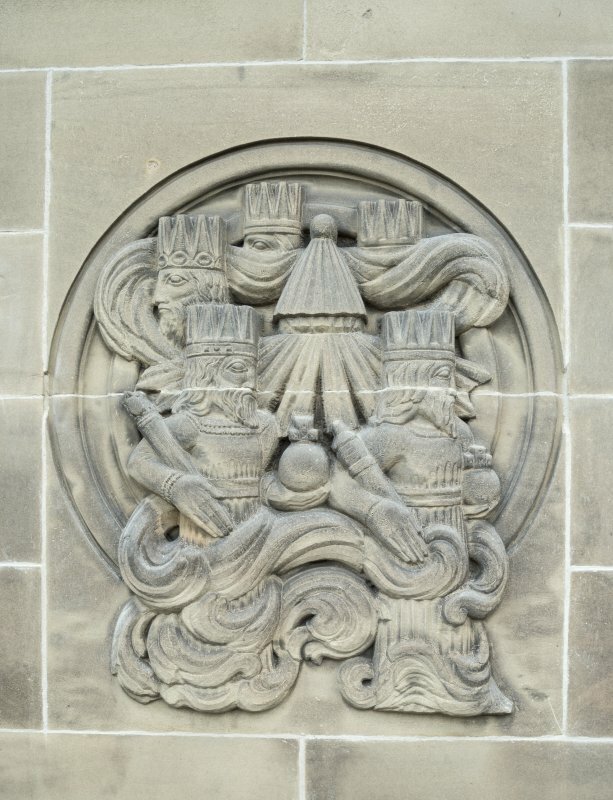 View of part of W facade of National Library of Scotland, showing carved personifications of Medicine (left) and Science (right), with Celtic motif roundels above. 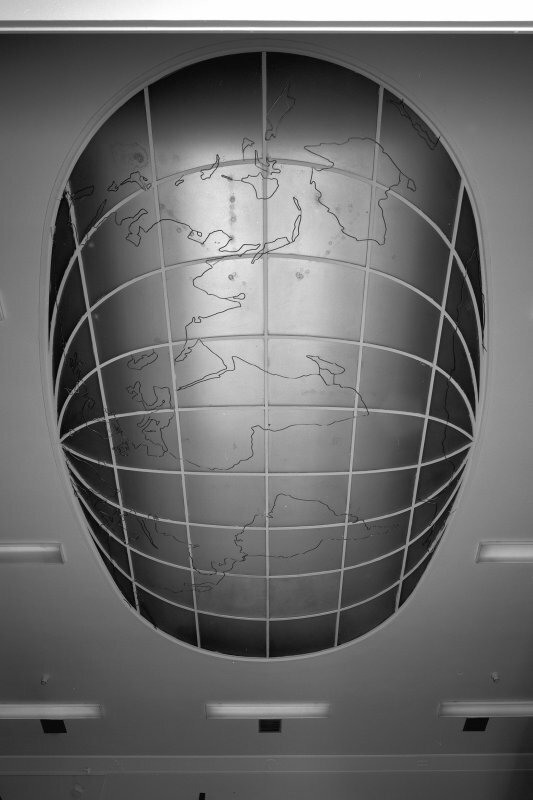 Ground floor, Music room, detail of map design on ceiling. 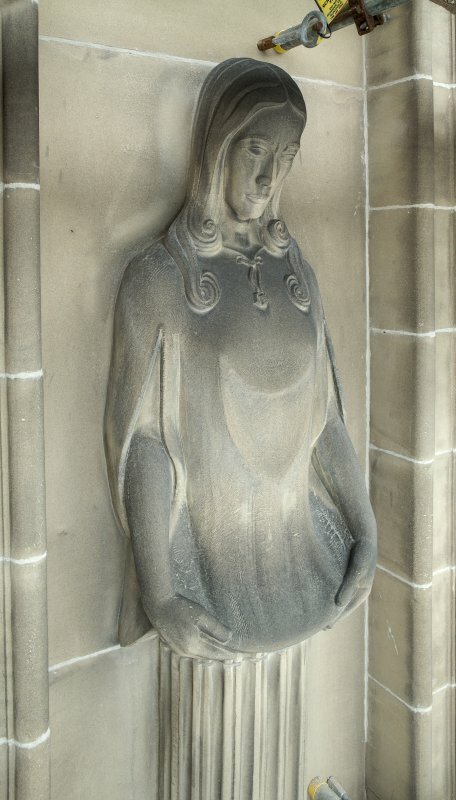 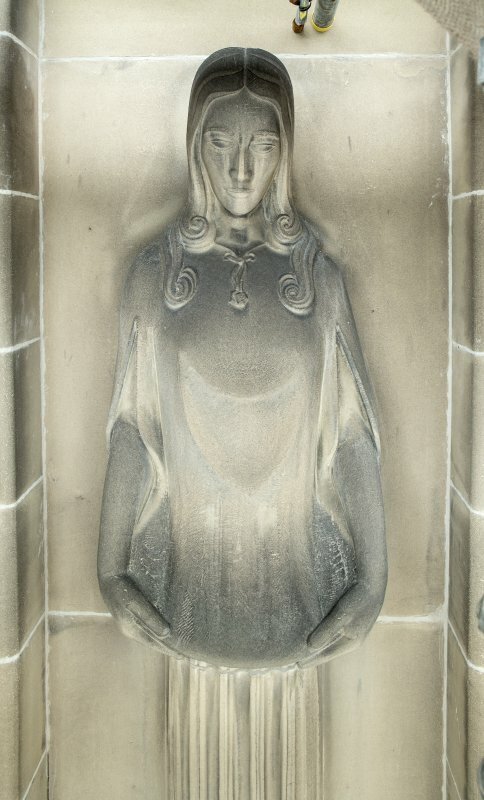 General view of roundel above The Poetic Muse figure. 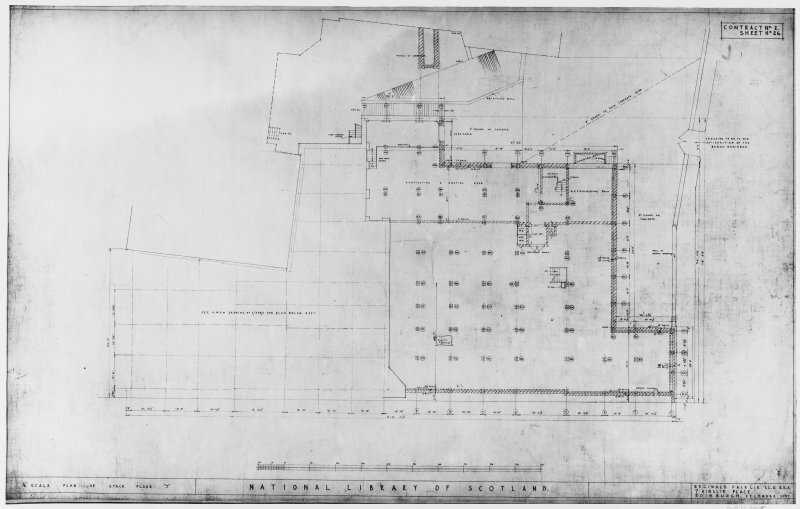 Section detailing levels of library. 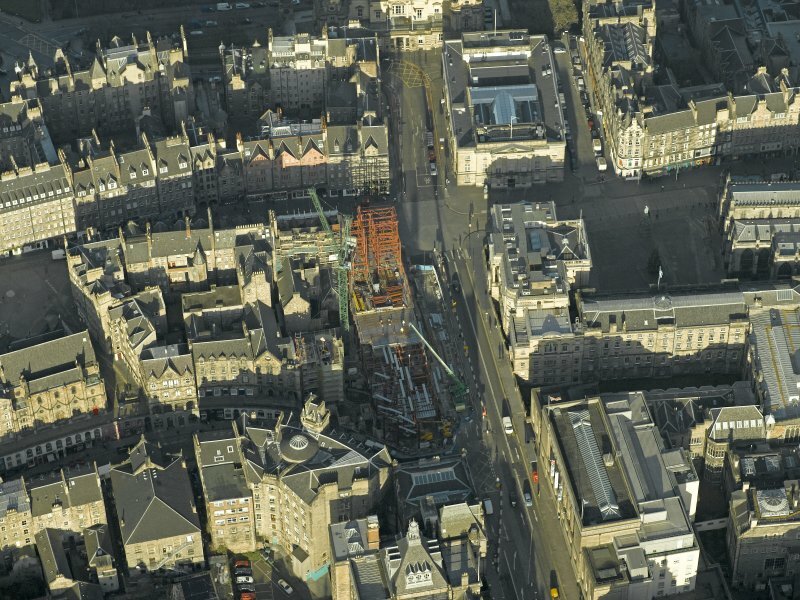 Oblique aerial view centred on new construction work at the junction of High Street and George IV Bridge, taken from the S.
Oblique aerial view centred on new construction work at the junction of High Street and George IV Bridge, taken from the N.
Upper level, Reading room, view from North Digital image of C 44292 CN. 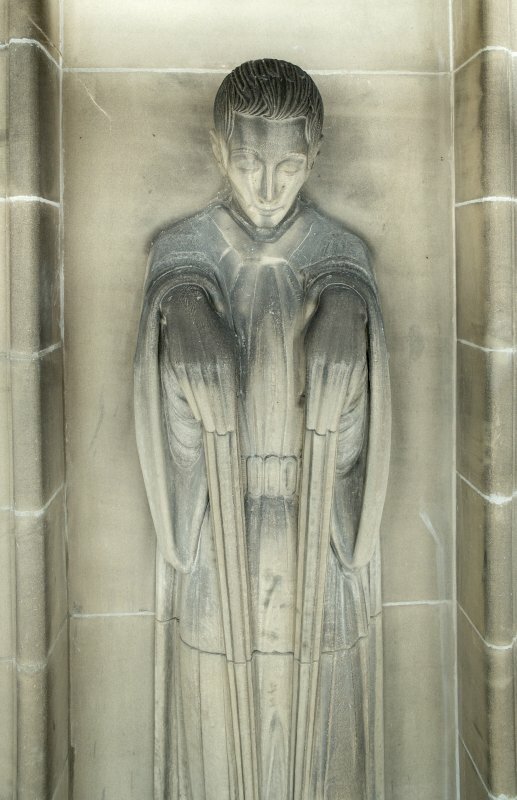 General view of roundel above History figure. 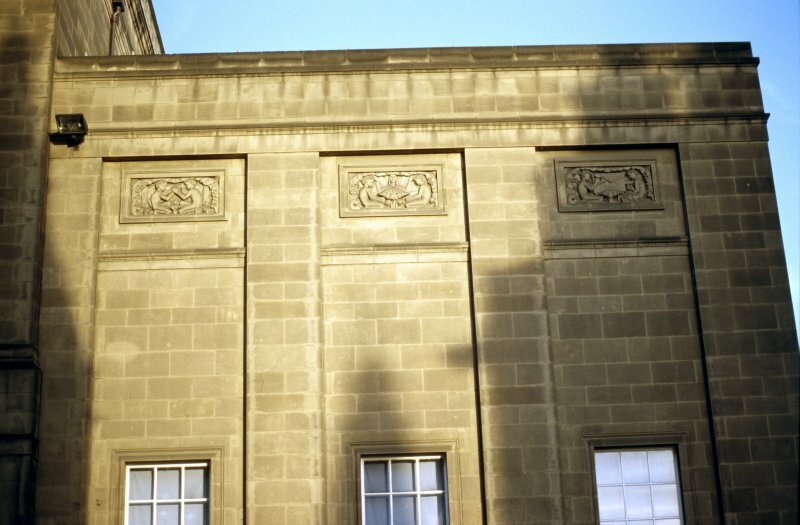 View of part of W facade of National Library of Scotland, showing carved personifications of History, Creative Writing and Law (left to right), with Celtic motif roundels above, and the Royal Arms of Scotland below. 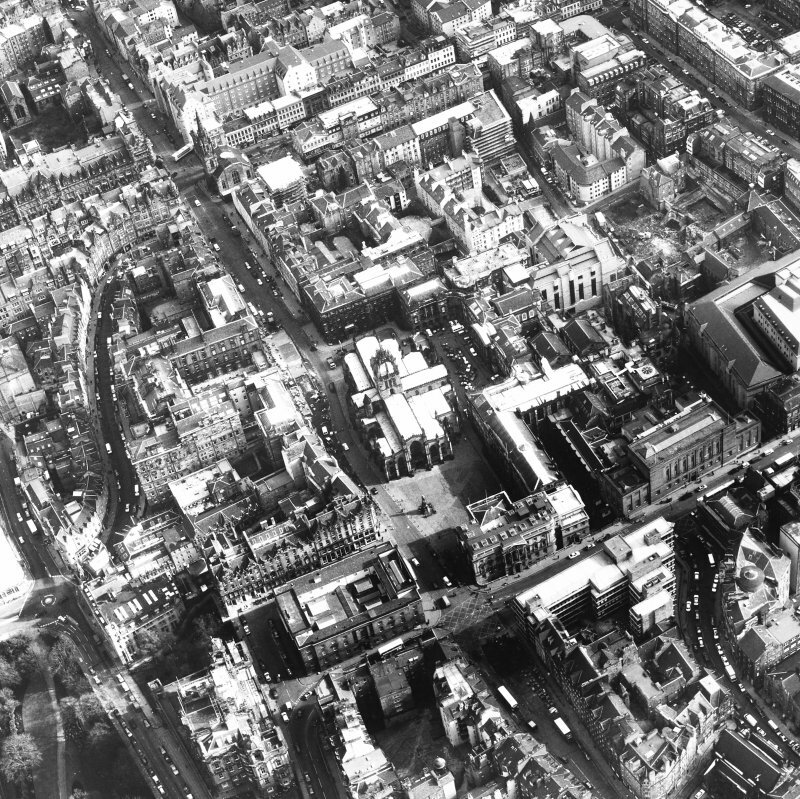 Oblique aerial view centred on the libraries, offices and the construction of the bank and hotel, taken from the SW.
General view of roundel above Science figure. 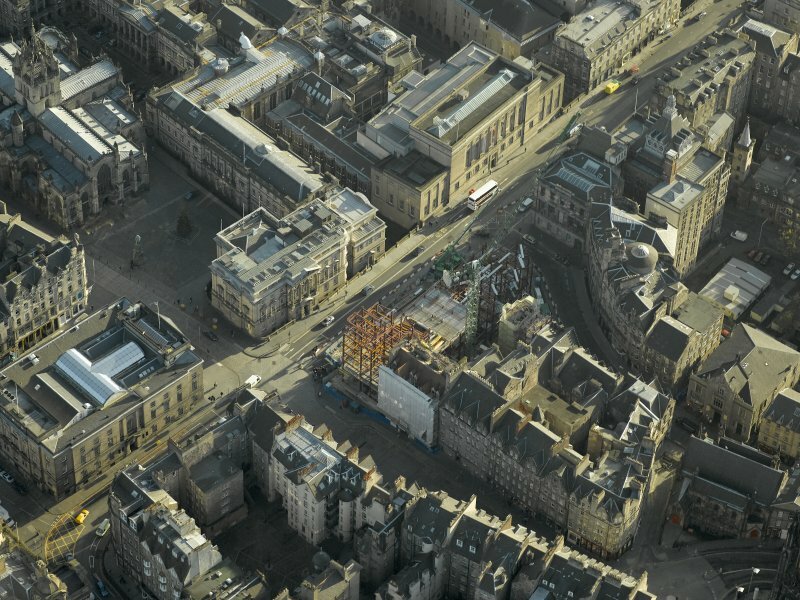 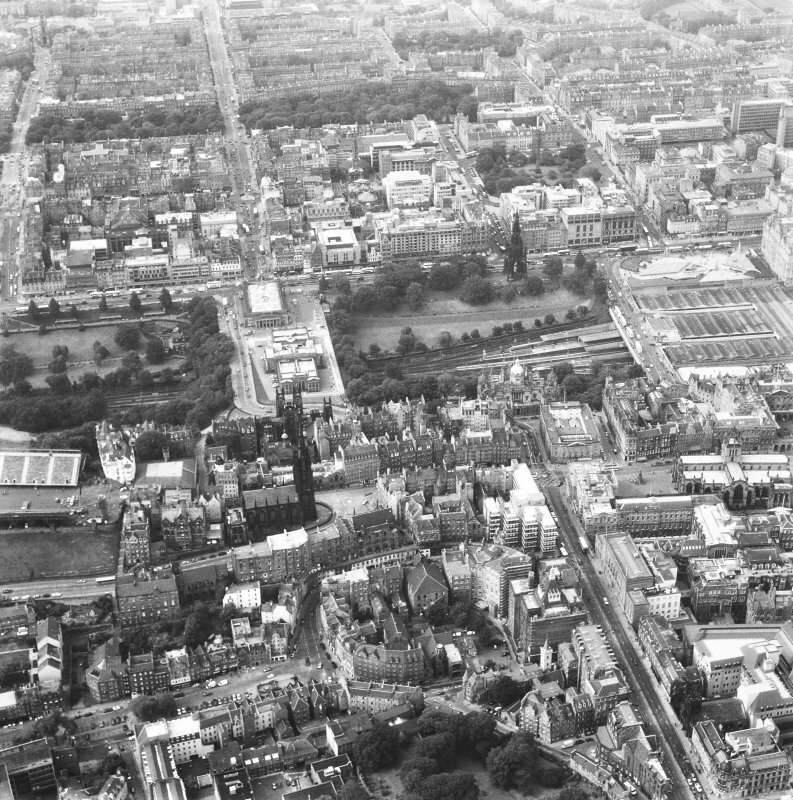 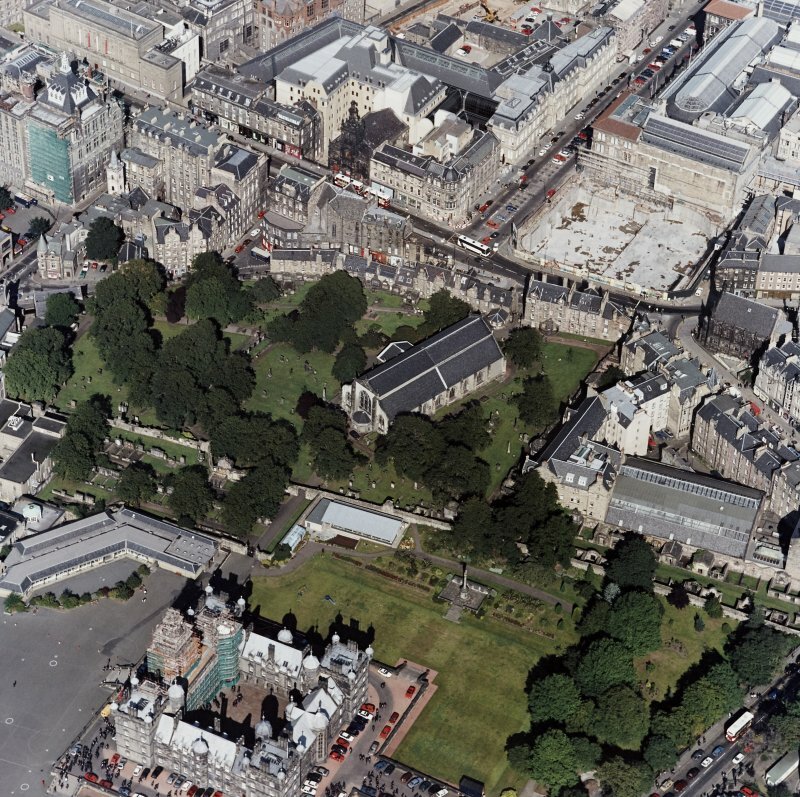 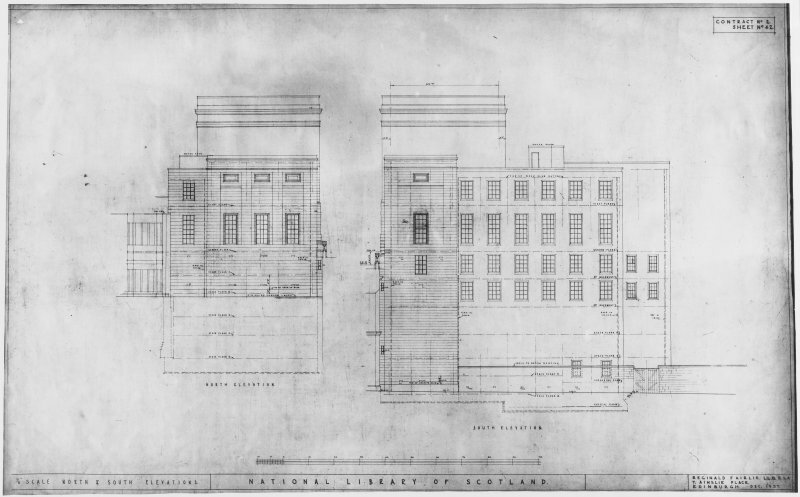 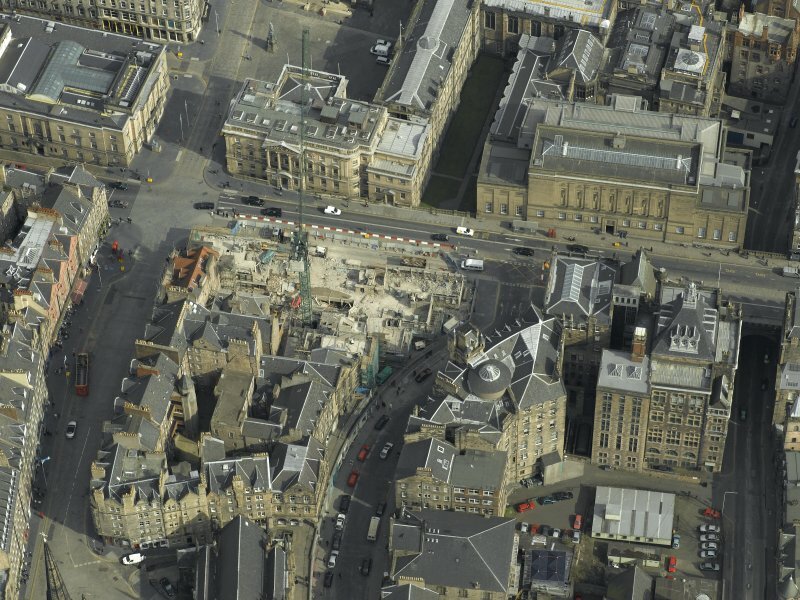 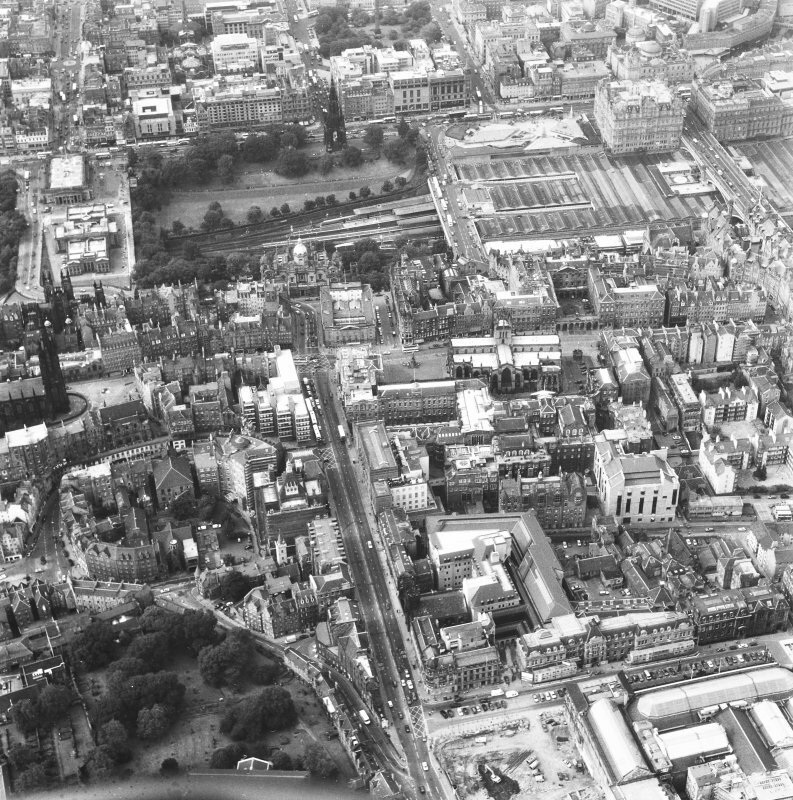 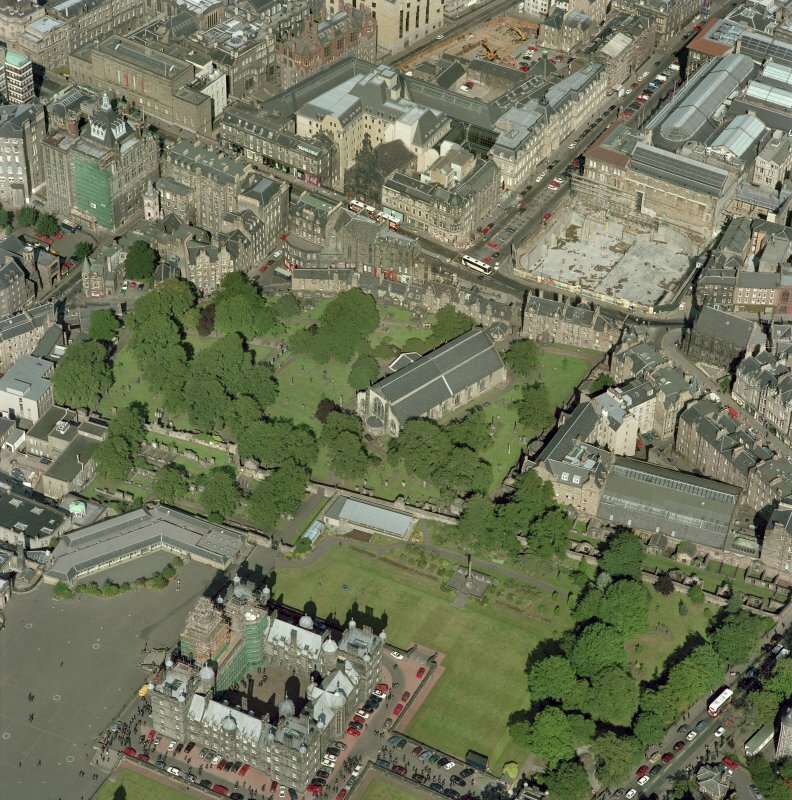 View of National Library of Scotland from SW.
Oblique aerial view centred on new construction work at the junction of High Street and George IV Bridge, taken from the NE. 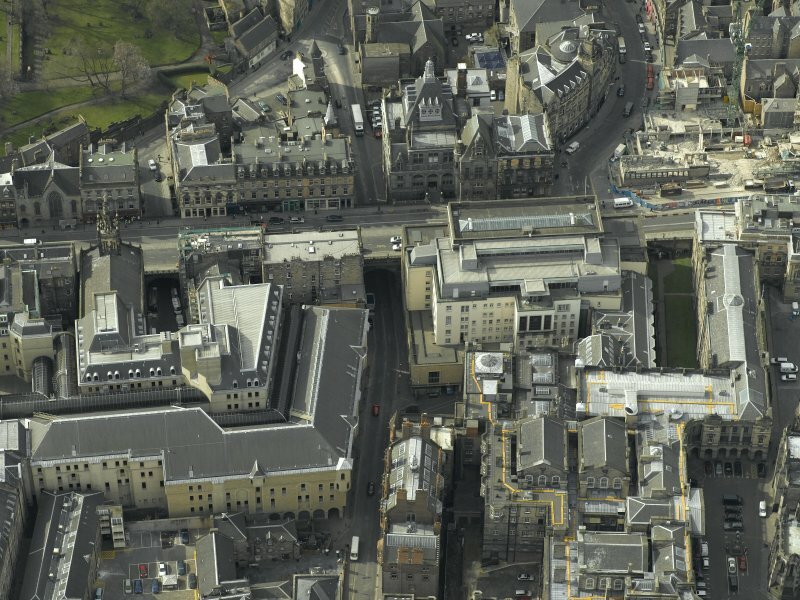 Oblique aerial view centred on the libraries, taken from the ENE. 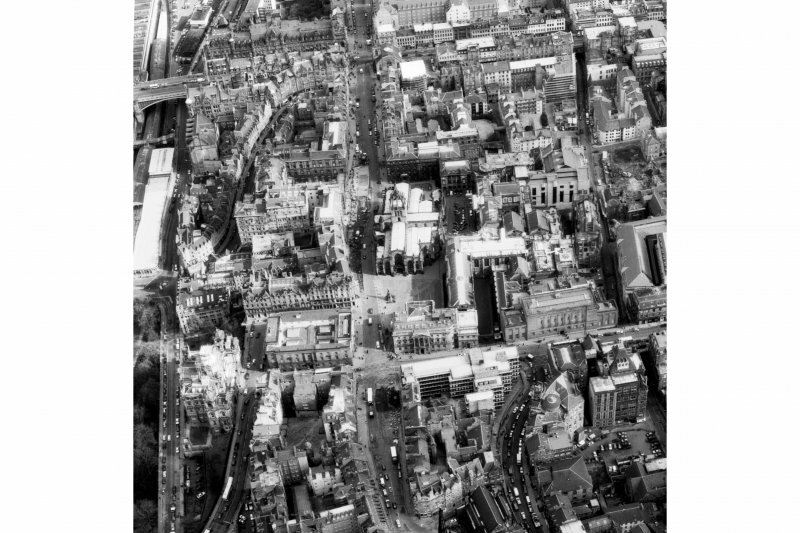 Oblique aerial view centred on the libraries, taken from the W.
Scanned image of IGL W718/3/11 [negative number to be supplied]. 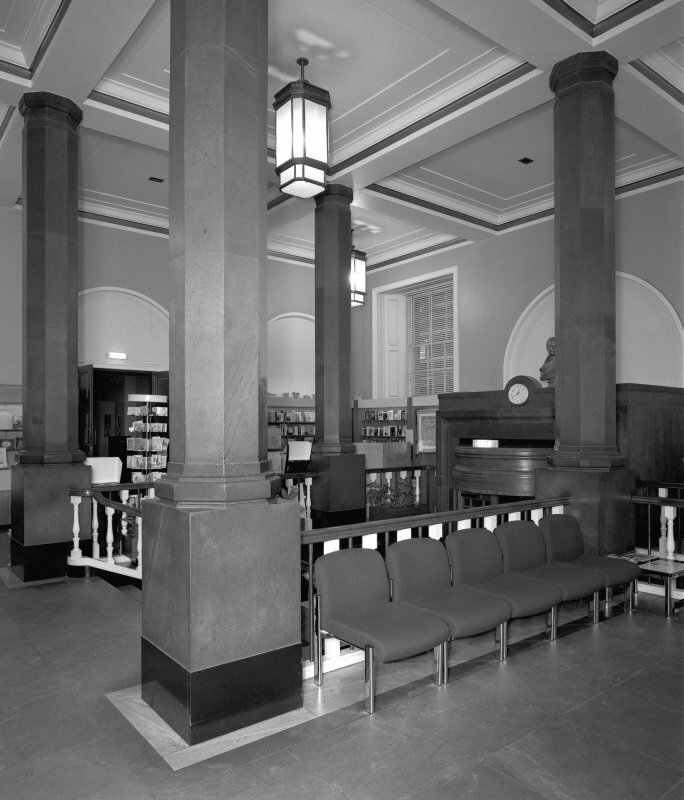 Lower level, Reading room, view from South Digital image of C 44290 Cn. 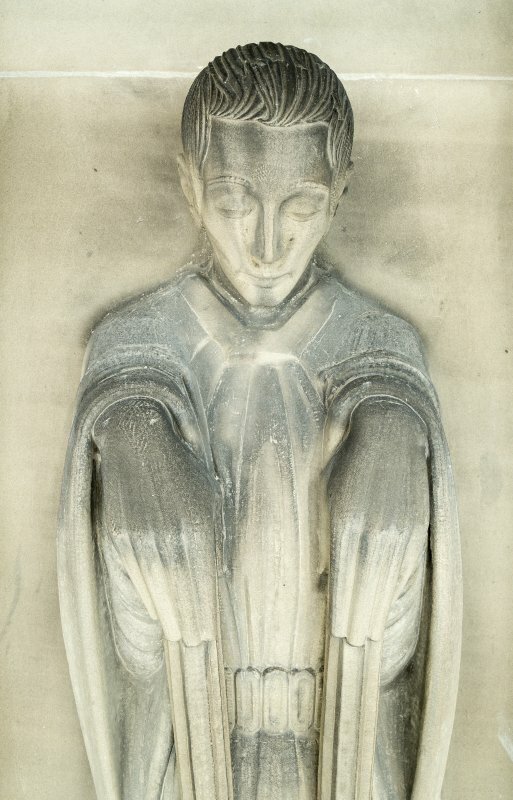 General view of roundel above Theology figure. 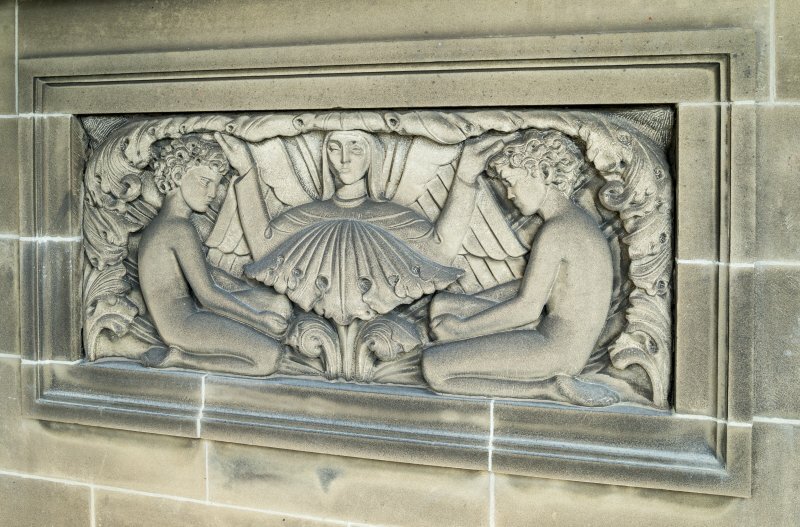 Middle sculptured panel on North wing. 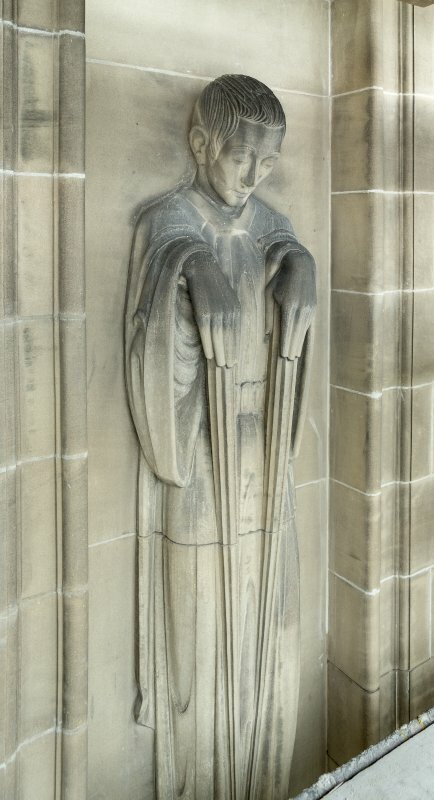 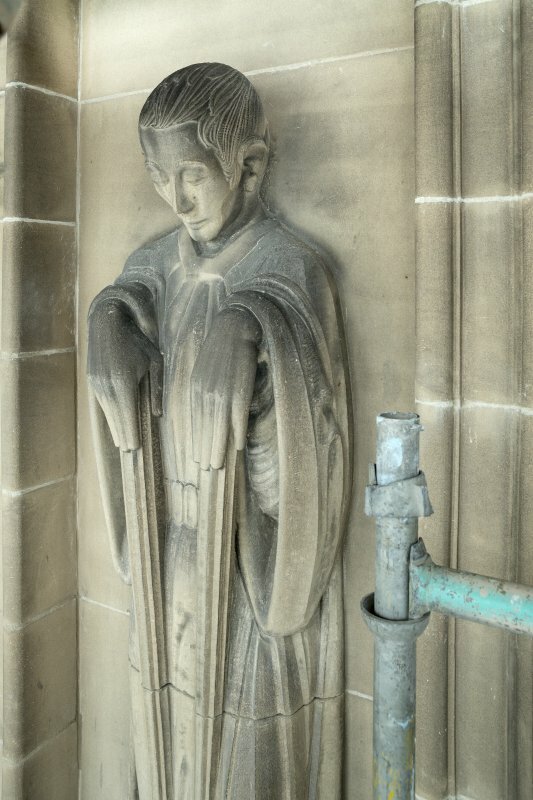 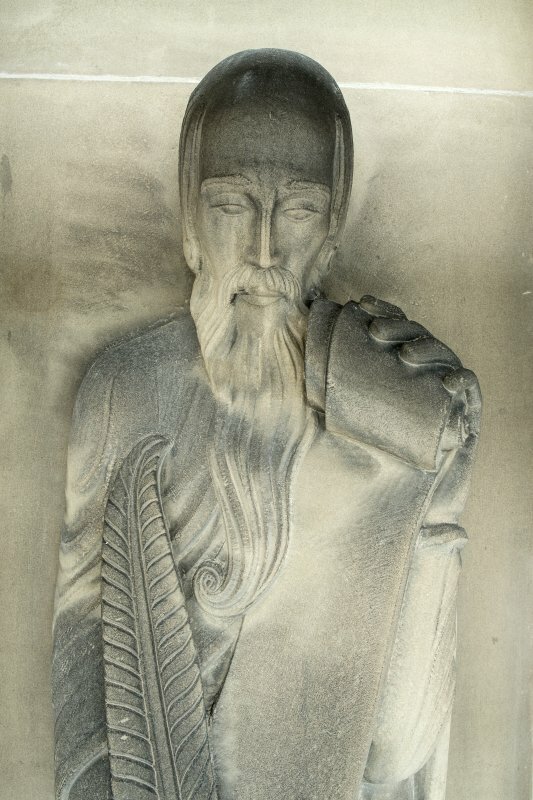 Left hand sculptured panel on South wing. 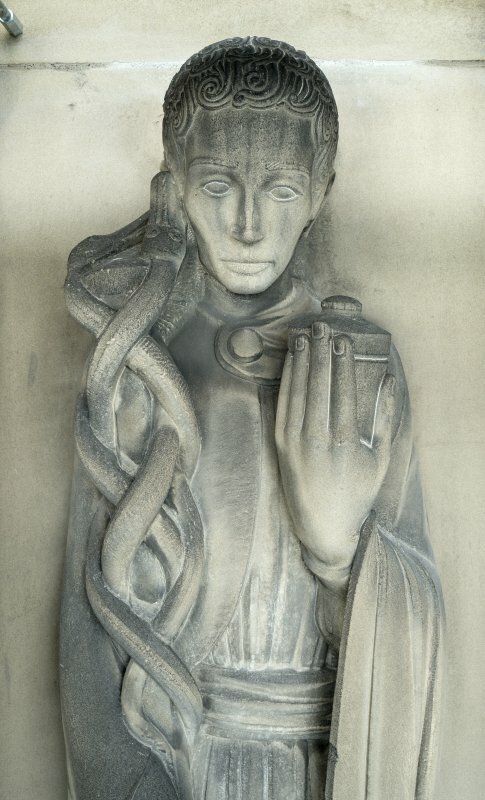 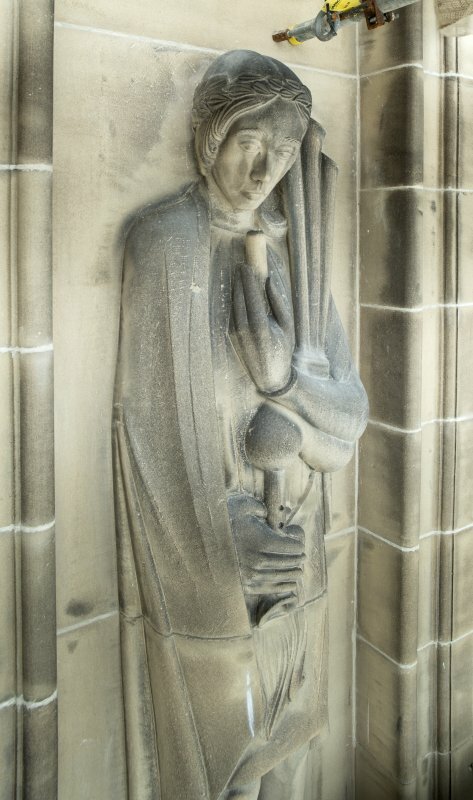 Figure sculpture representing Music, National Library of Scotland, Edinburgh. 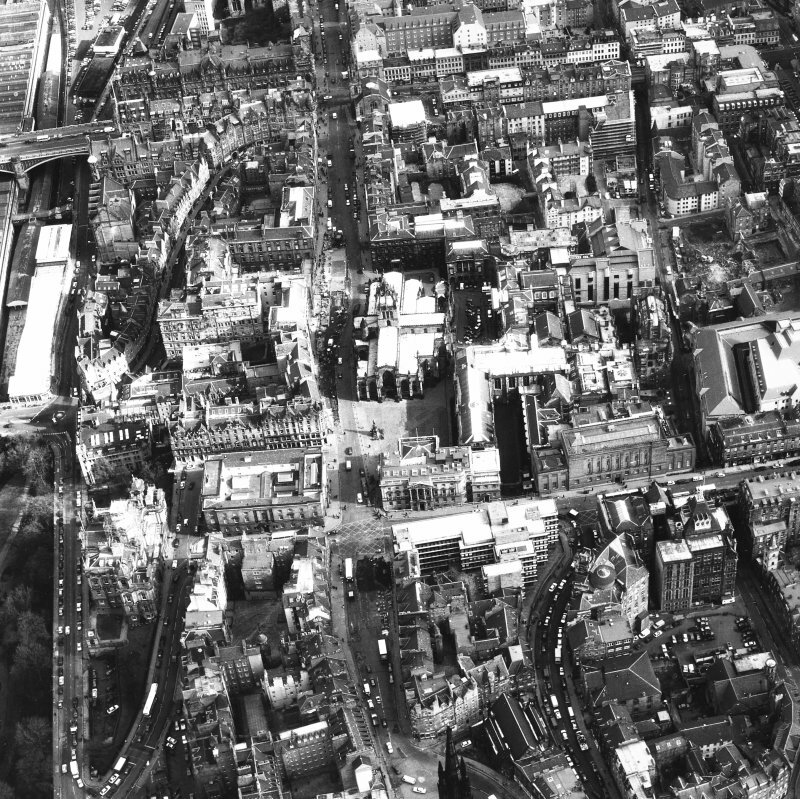 Scanned image of IGL W718/3/10 [negative number to be supplied]. 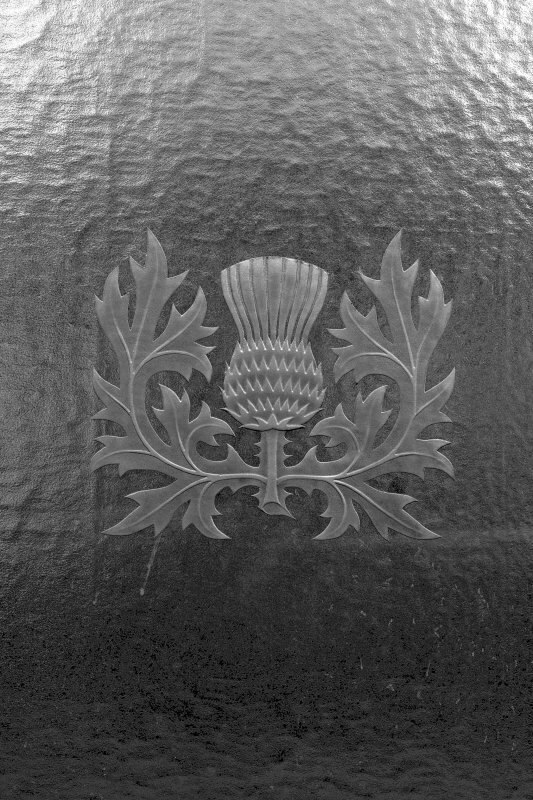 First floor, landing staircase, detail of thistle design etched in window. 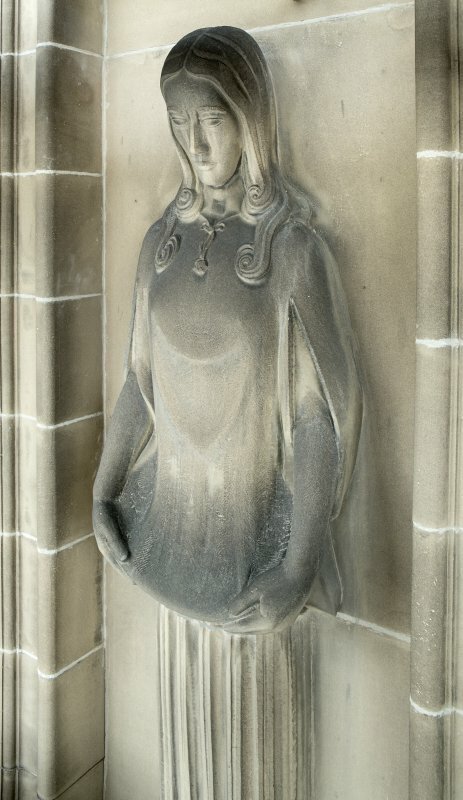 Digital image of C 44300. 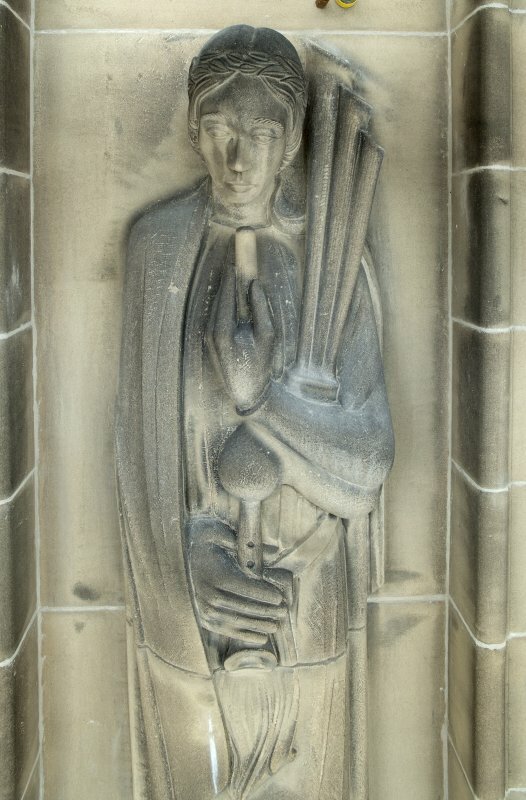 General view of roundel above Music figure. 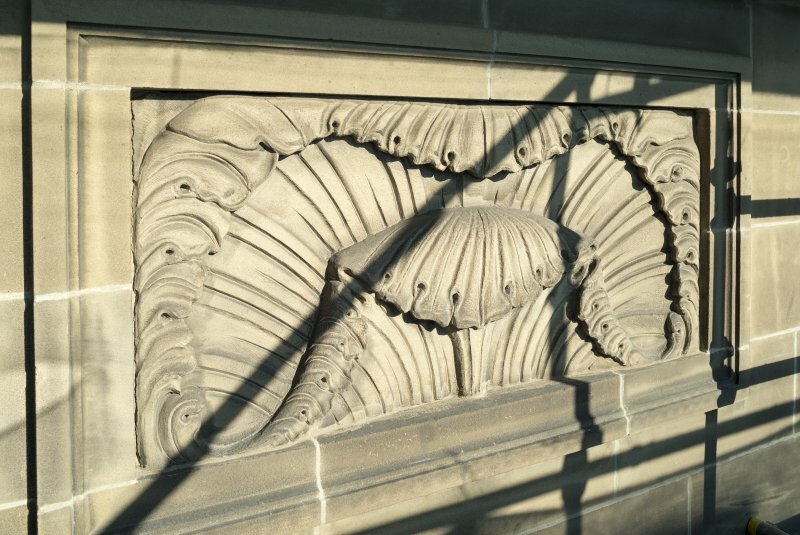 Middle sculptured panel on South wing. 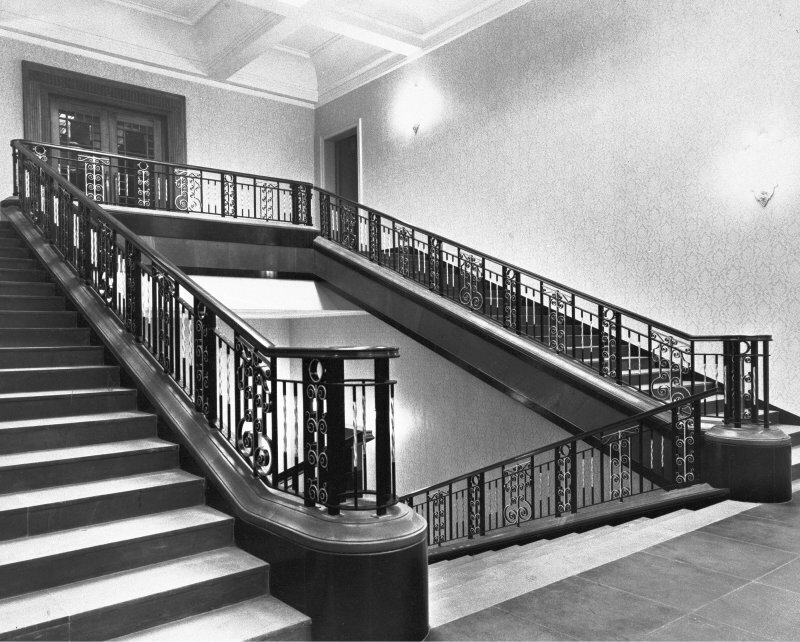 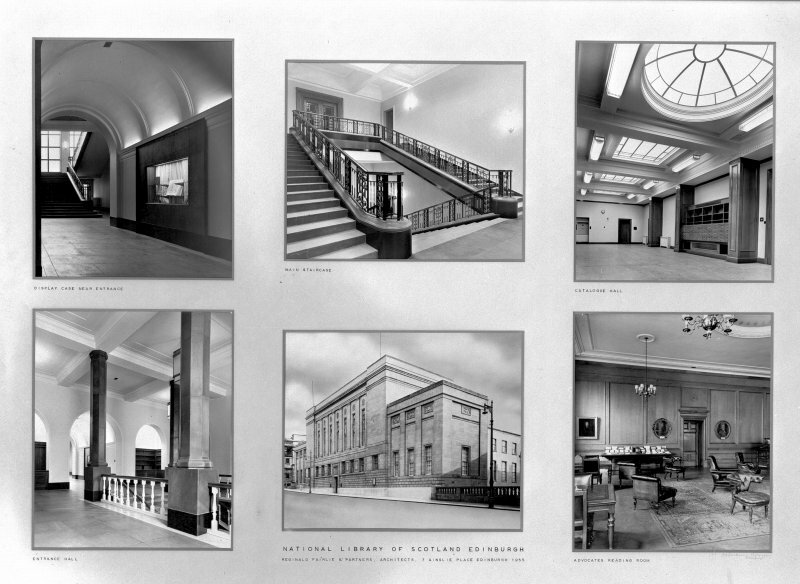 Sections through entrance hall and lecture room. 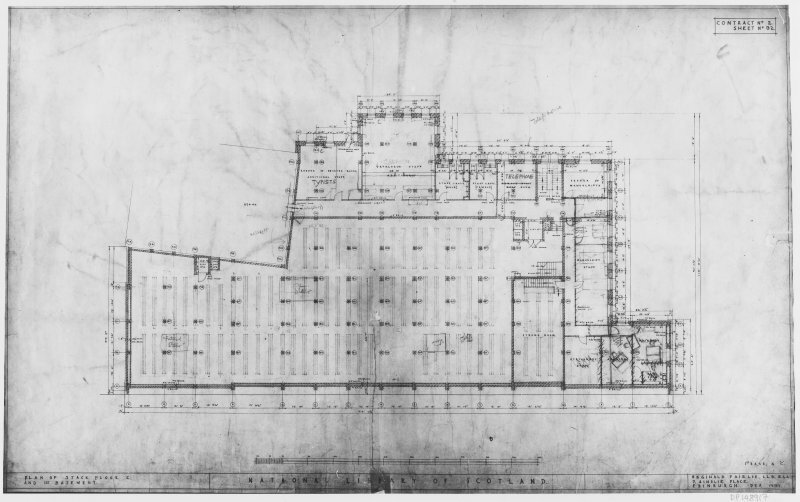 Plan of stack floor and first basement. 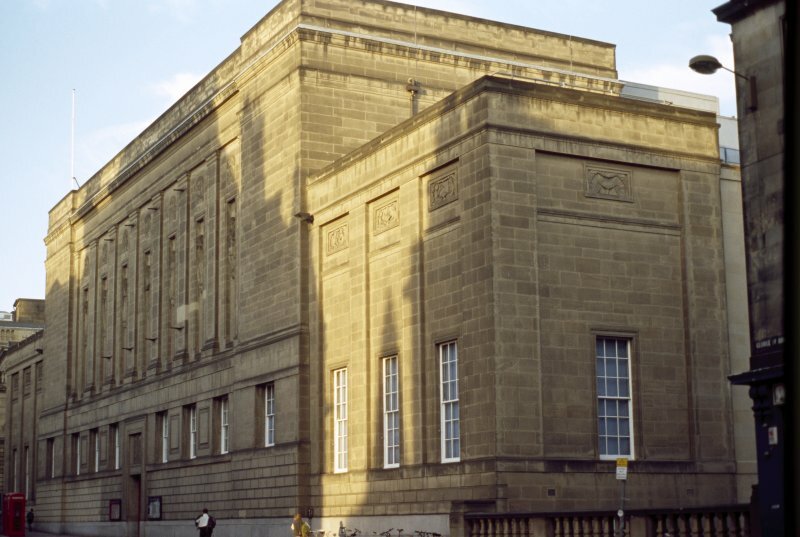 View of S wing of W facade of National Library of Scotland, showing panels carved with the 'Arts of Communication'. 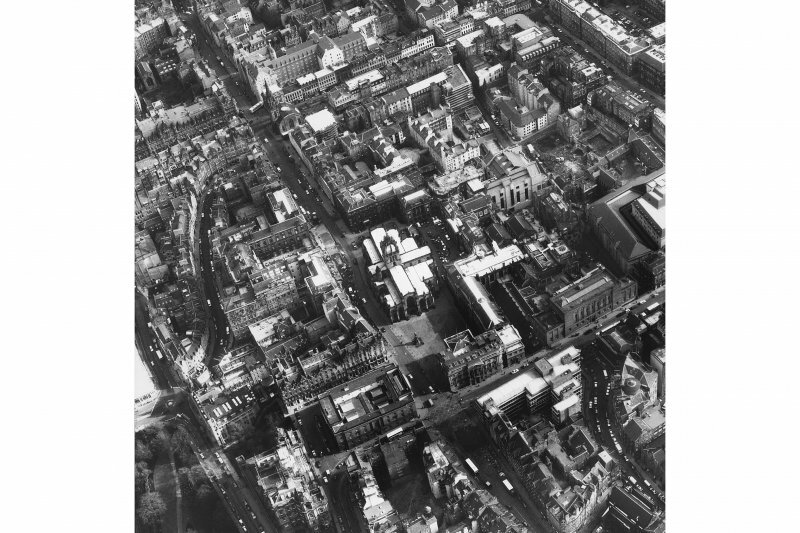 Oblique aerial view centred on the construction of the bank and hotel with the offices and libraries adjacent, taken from the E.
Photographic copy of large framed set of six photographs including views of display case near entrance, main staircase, catalogue hall, entrance hall, general view and Advocates reading room. 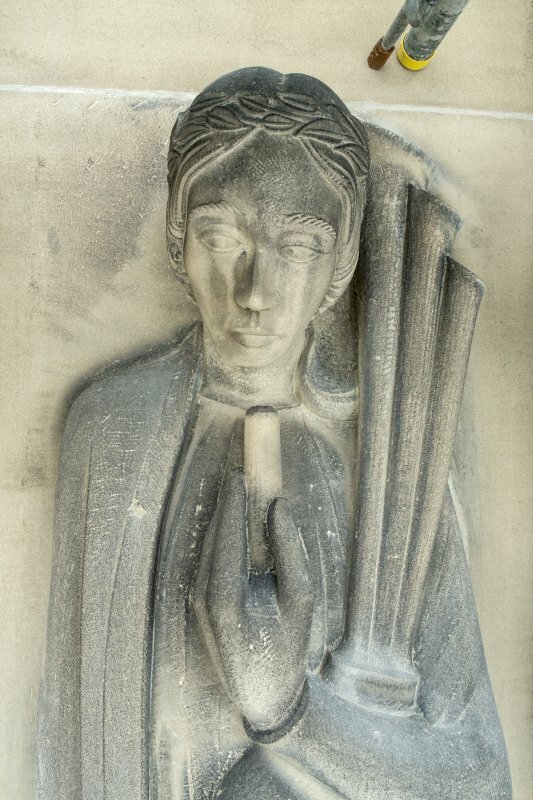 Digital image of E 21139. 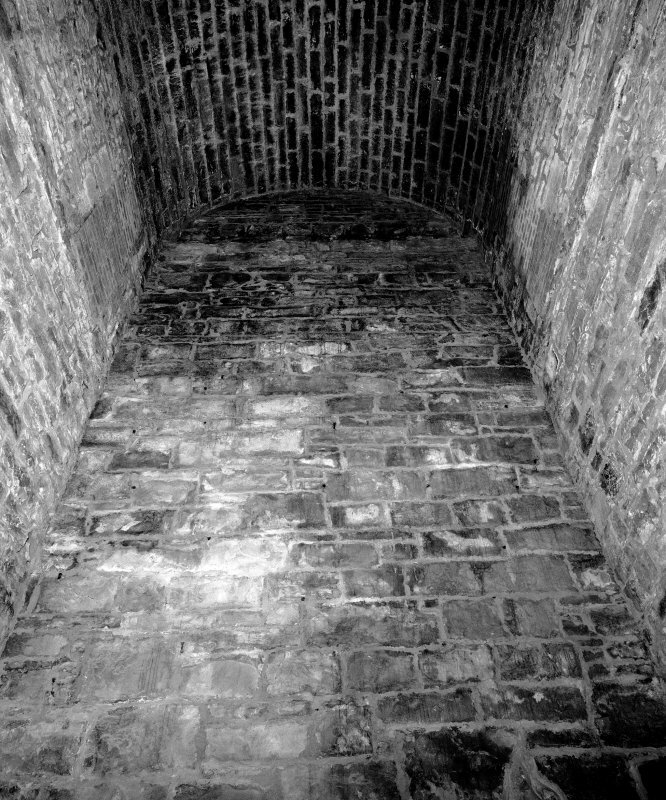 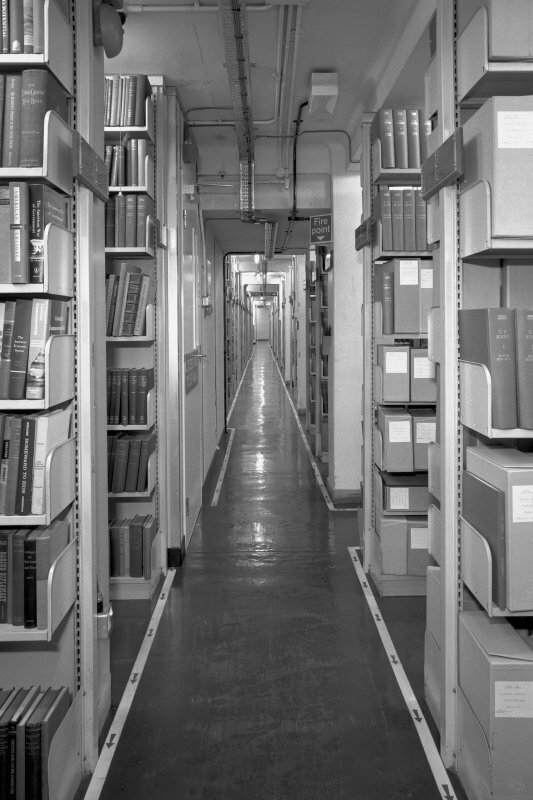 Storage level, E/F floor, view of central corridor from South. 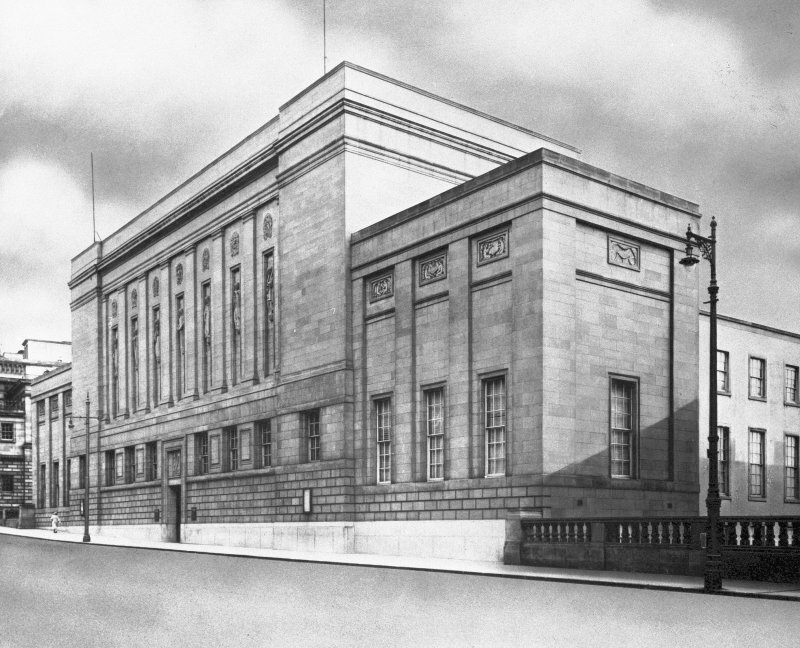 ARCHITECT: Reginald Fairlie, 1936-55 (completed by A R Conlon, 1950-55). 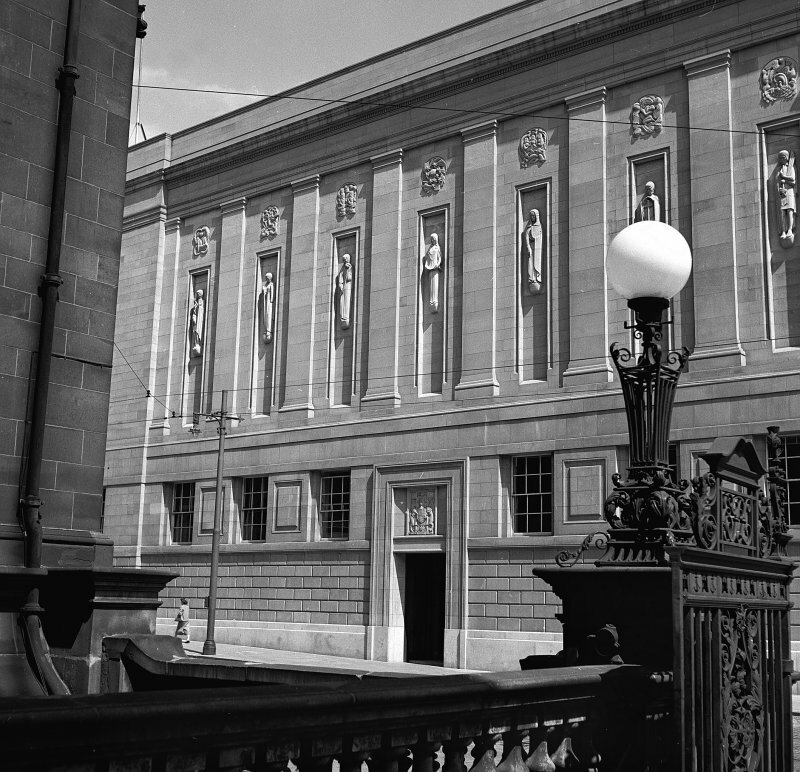 Edinburgh, George IV Bridge, National Library of Scotland. 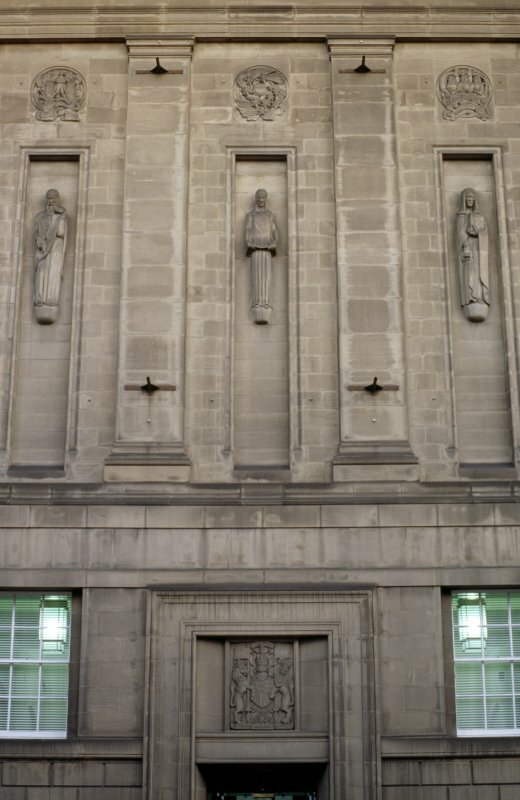 Arts, History, Theology, Science and Medicine - 6 carved capitals and 2 half capitals to pilasters coat of arms, 6 panels on side wings, #10,200 in Blaxter stone. 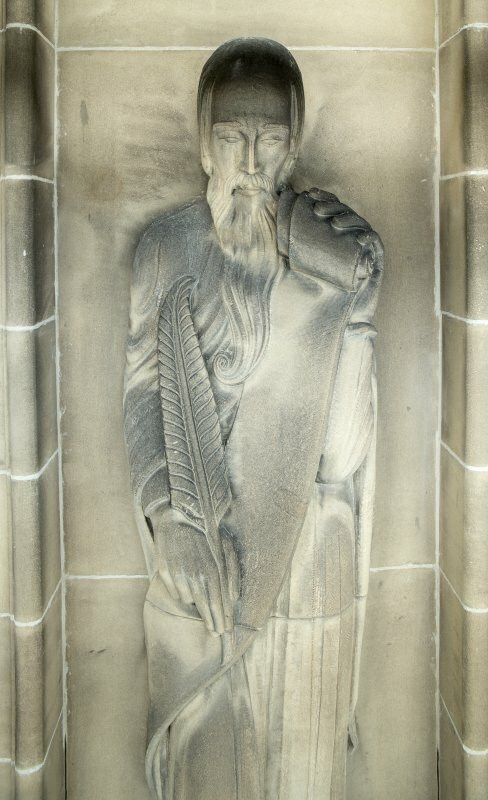 3 volumes of photocopies of Reginald Fairlie MS 1933-55 text. 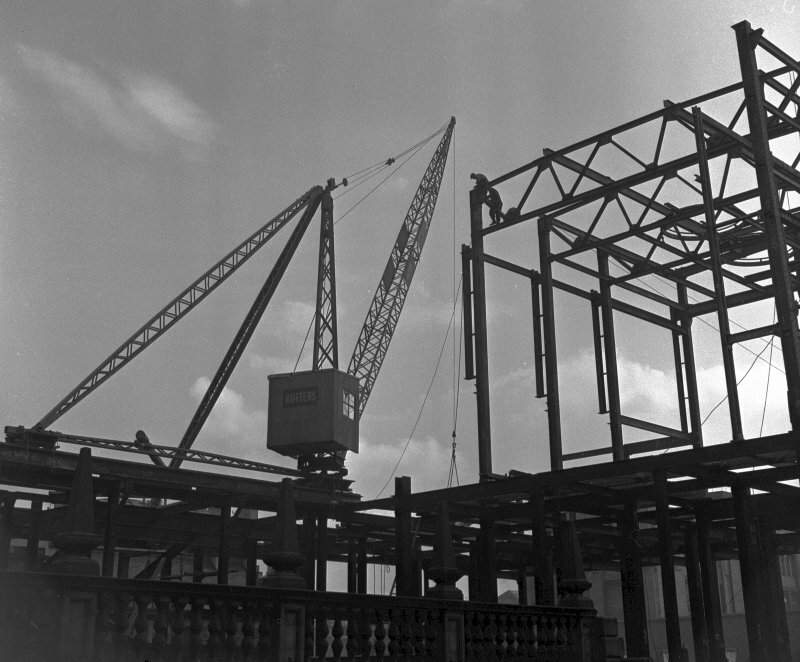 The last natonal setpiece of interwar classic monumentalism - completed after the war, its steel frame having lain unfinished throughout the conflict. 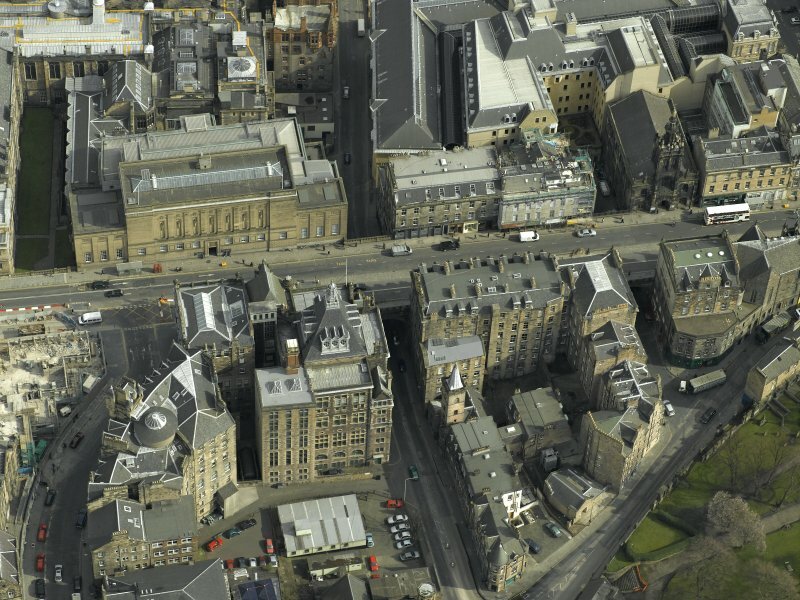 A nine-storey block built on deep piling, with striking sectional arrangement reflecting its dramatically precipitous site and high-level viaduct entrance. 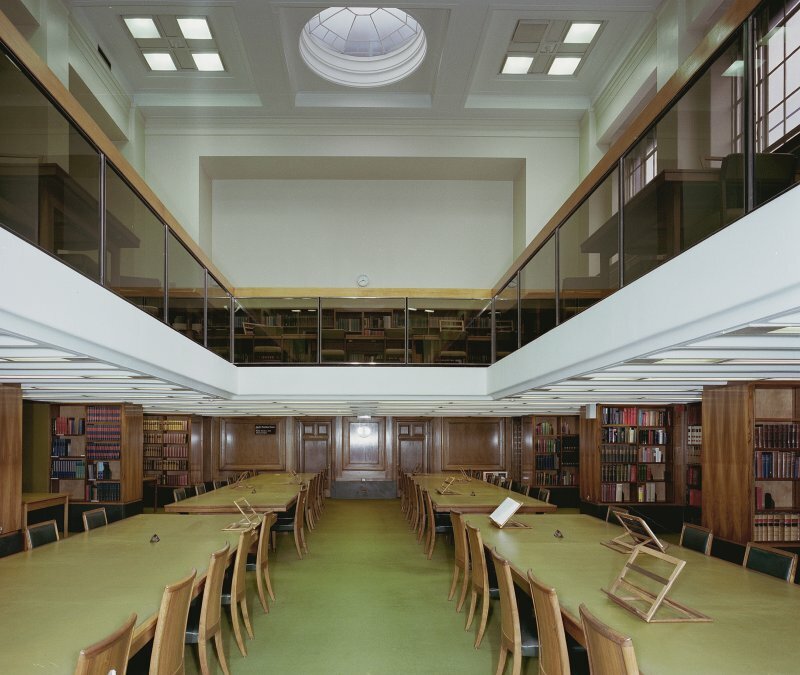 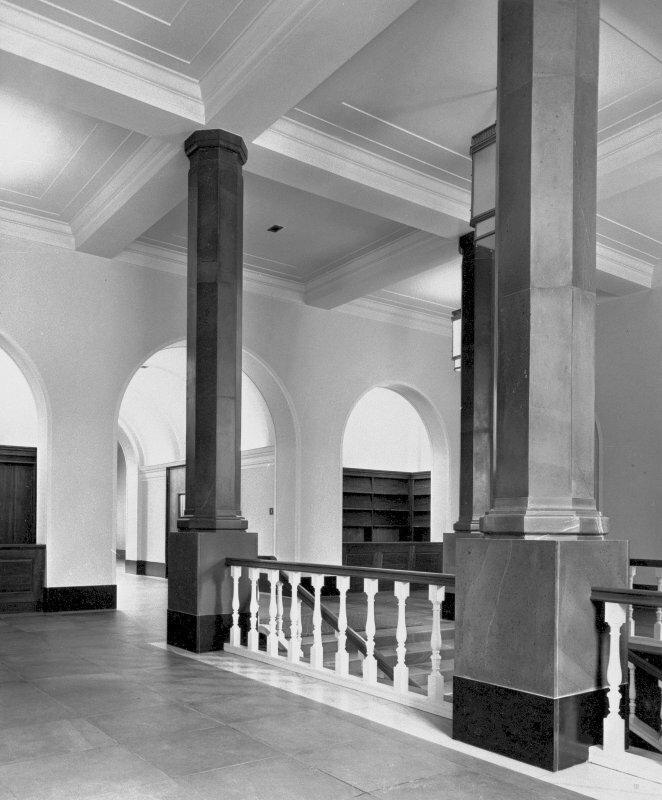 The top two floors contain public areas, including a lofty, austere reading room; below are seven stack floors. 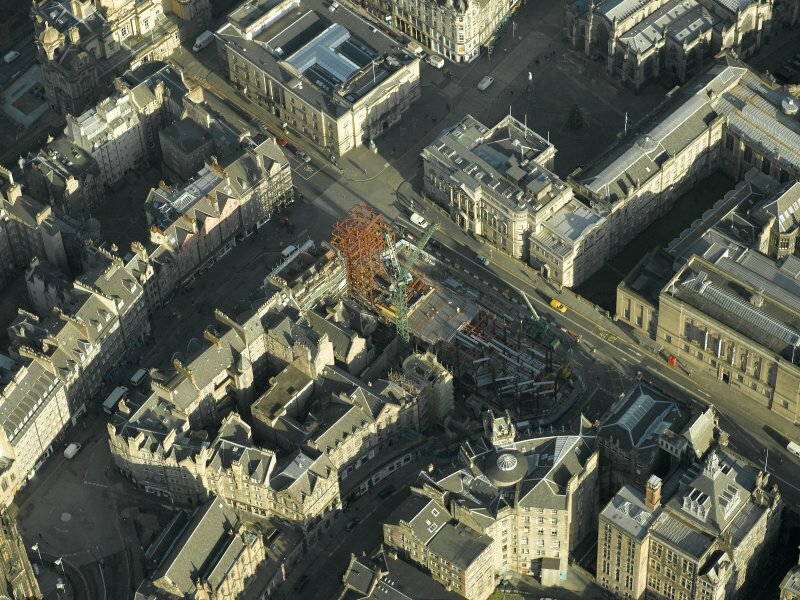 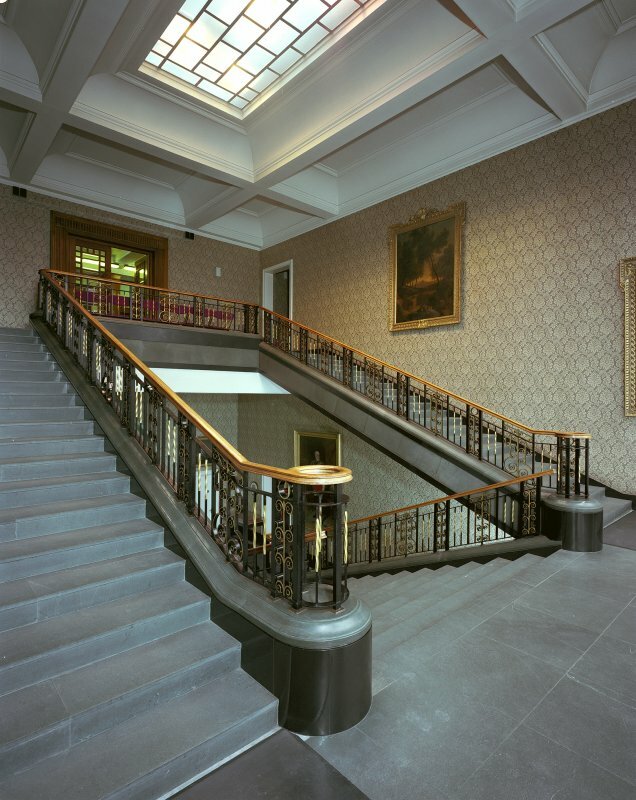 Architecturally, the public accomodation is expressed by a sheet, pilastered screen wall between broad, flat piers and lower flanking pavilions, echoing both the overseas classicism of the later '30s, and the earlier neo-classical heritage of this country (notably Archibald Simpson's New Market, Aberdeen, 1840-2). 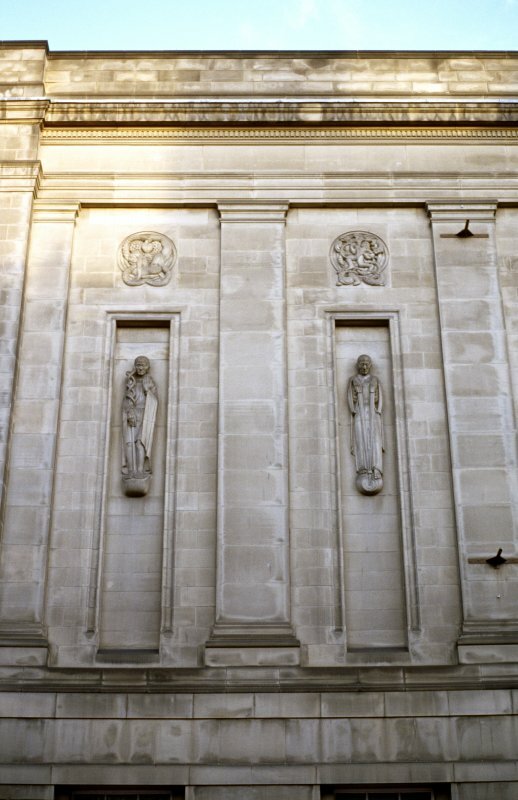 The facade was decorated with attenuated sculptures by Hew Lorimer. 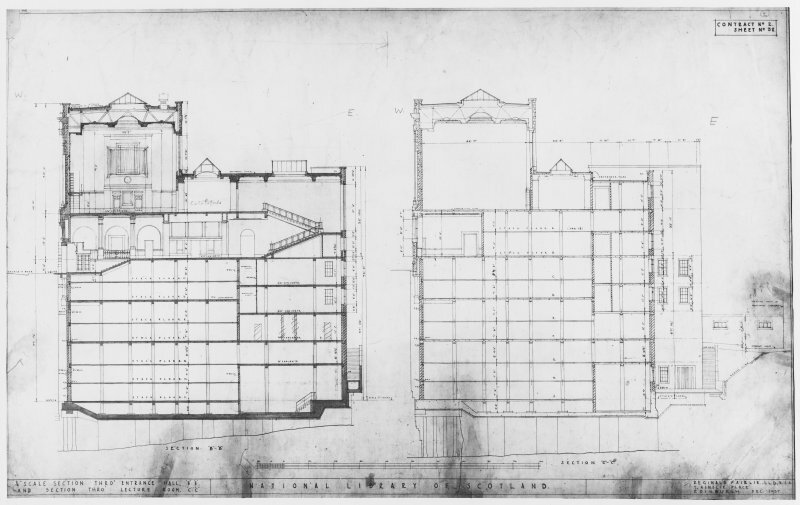 (Fig. 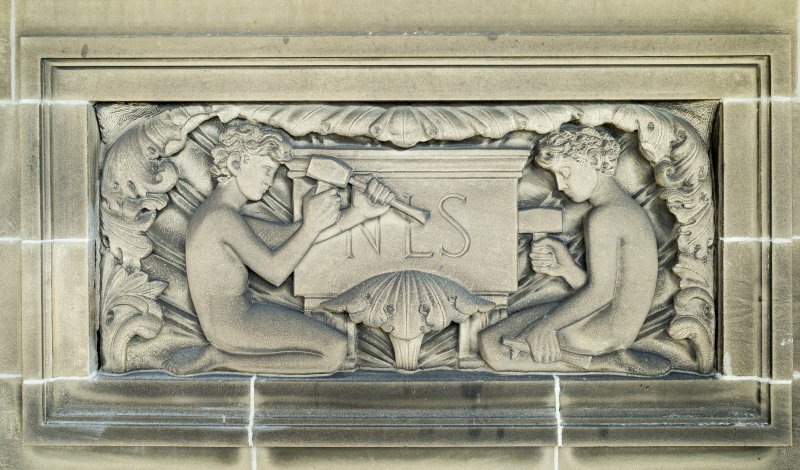 4.21).